Elise and Jeff have it all. Brains, beauty, style (did I mention brains?!?) and sophistication! 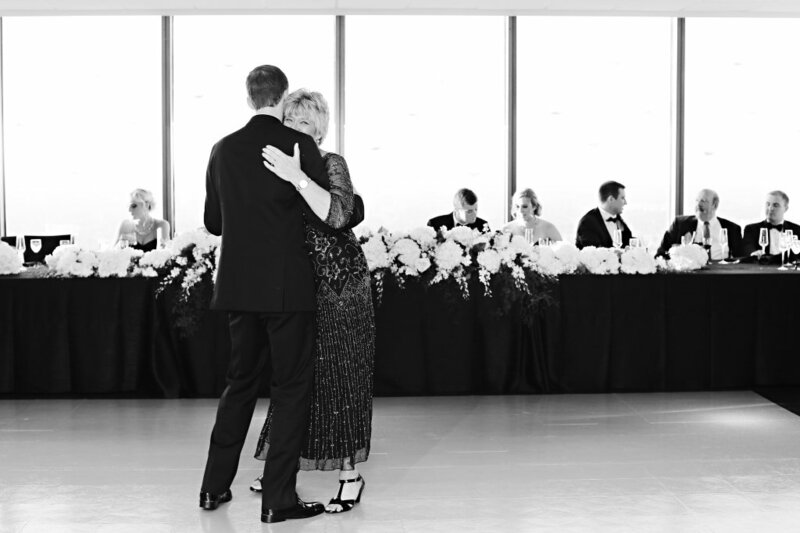 They are madly in love, and entirely adorable – and boy can they move on the dance floor. 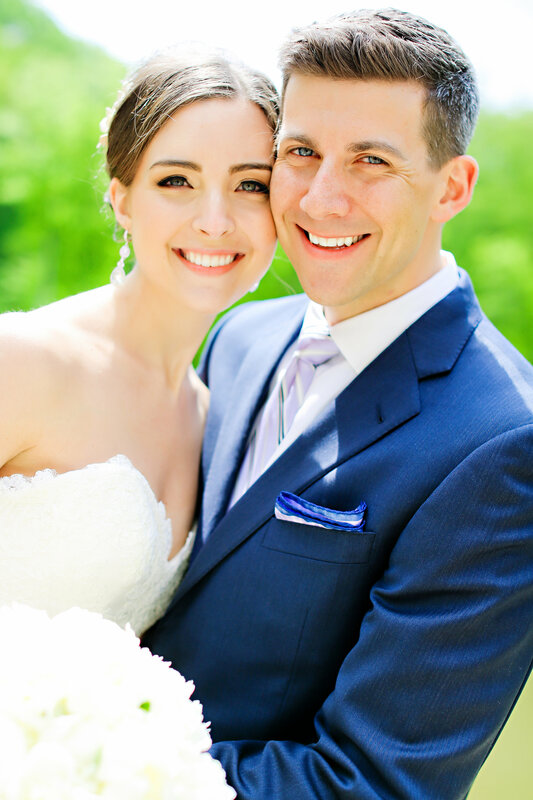 Their wedding was nothing short of a dream to be part of, and it was truly an honor to help create their wedding weekend for their family and friends. 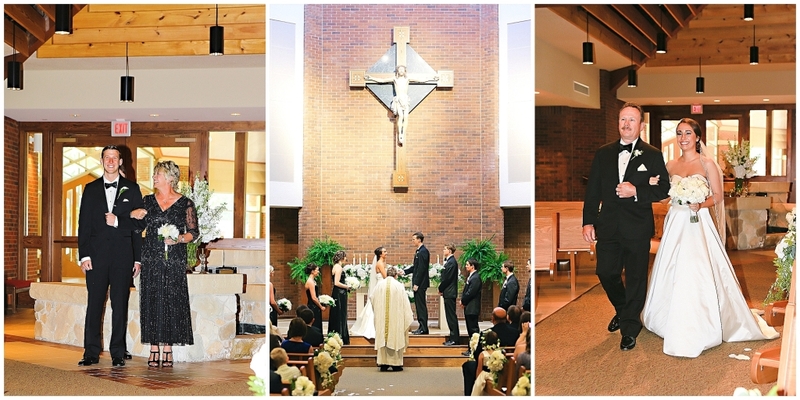 Their ceremony was designed in such a clean and smart way – I loved it. 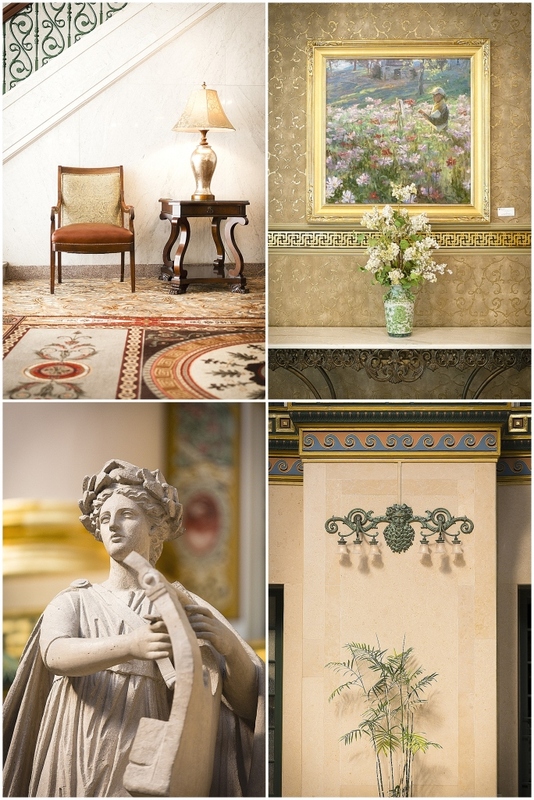 It was simple, beautiful and looked regal in the stately gallery space of the IMA. 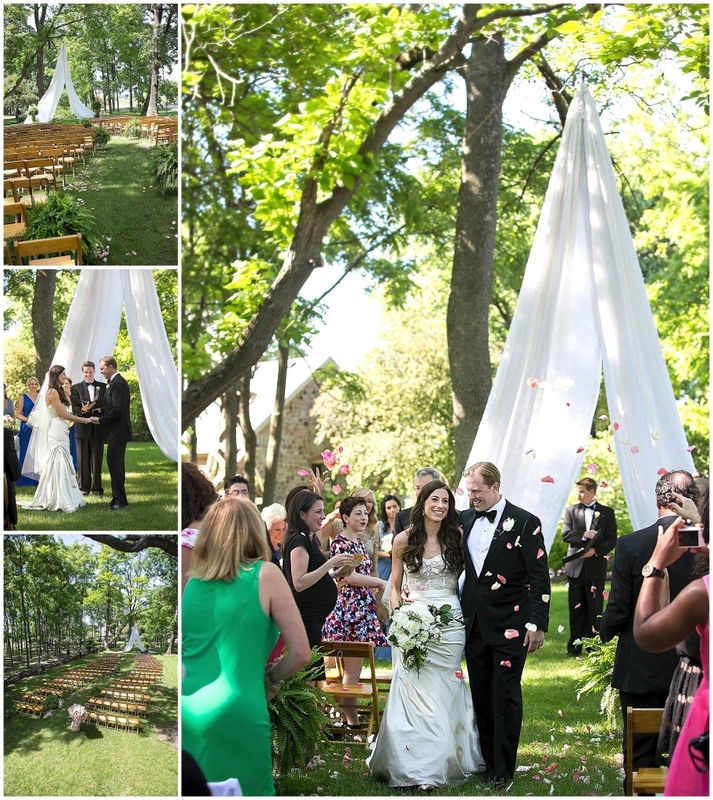 The sleek chuppah had a feminine elegance in the modern space and allowed guests to focus on the solemnity of the service officiated by Elise’s uncle. Following the ceremony, guests enjoyed cocktails outdoors on the (couldn’t be better!) fall evening. Elise, Jeff and their families are undoubtedly foodies. Guests enjoyed an incredible selection of menu all evening starting with the cocktail hour, through the dinner options, and into the late night snacks. The catering was superb and each guest adored their personalized acrylic place card. 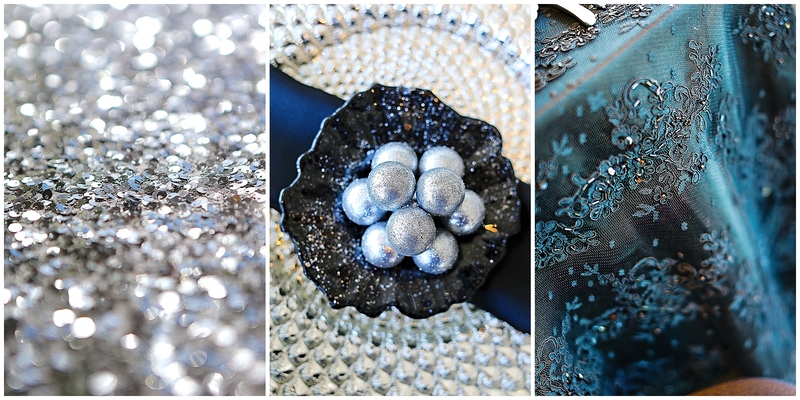 These, along with clear chairs and linens helped the ballroom sparkle. 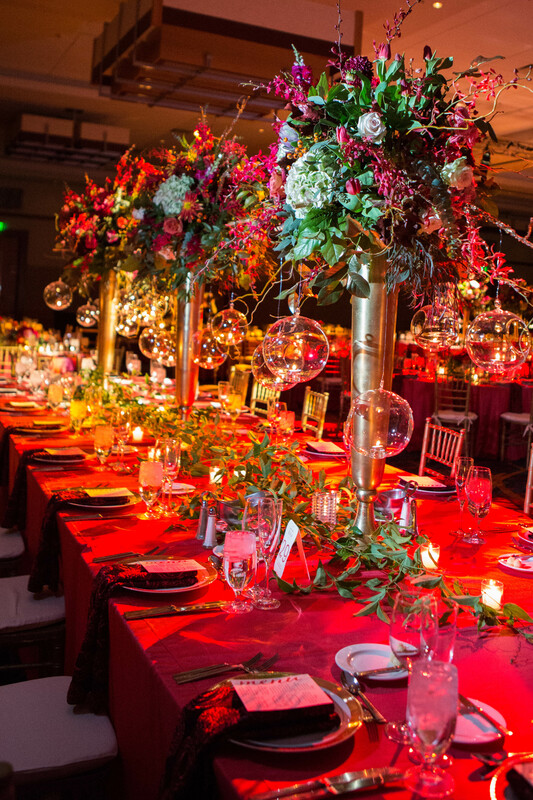 The long glistening tables set the tone for an evening full of great food, fantastic conversation and dancing — soooo much dancing! As a fun little surprise to the couple, Elise and Jeff’s team actually made their dance floor round to allow even more room for their guests to enjoy the (amazing!) band. We knew Jeff and Elise would work the floor, but their guests were also incredible dancers and we wanted as much space as possible. 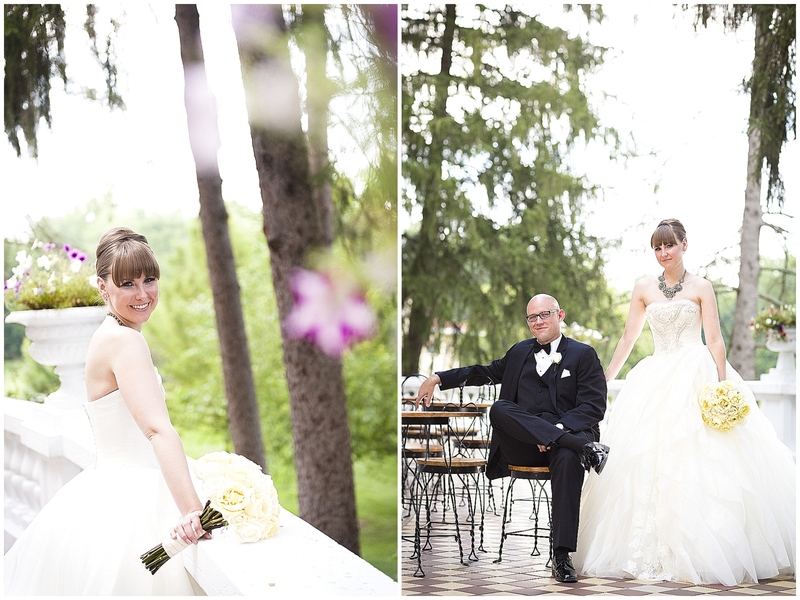 Elise and Jeff were truly a delight to work with throughout the process. They were decisions makers in every sense of the word. They don’t live in Indy, so flew into town solely to make their choices based on their team’s advice, demos / mock ups and were really decisive. 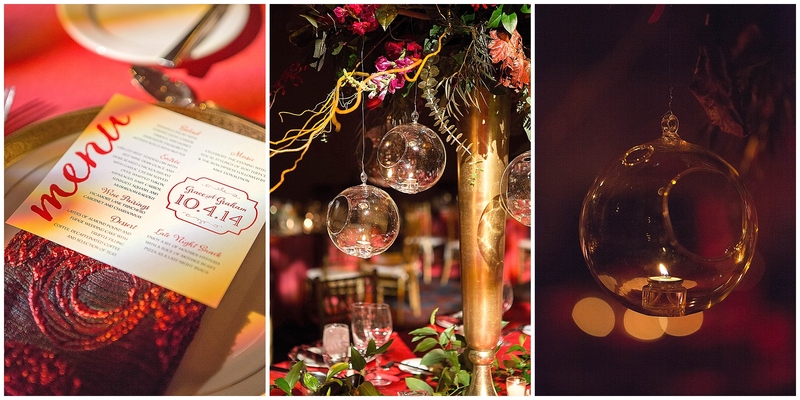 They selected their tablescapes, centerpieces and designs months in advance all based on ideas from their creative team curated through photos Elise had sent in advance of her travels. She and her mom entirely trusted the team to create their vision and it was fun for all us to collaborate on such a contemporary design. Following a night of dancing (I mean – sooooo much dancing! …they danced before dinner, they danced between courses, they danced and danced and danced the night away…) the guests went back outside one final time for a final farewell to the newlyweds. Cheers to you both, Elise and Jeff. May your world travels always be safe and adventurous, and may your dance card always be full. It’s Christmas in July, and working with this family it felt like I am the one lucky enough to be opening the gifts. 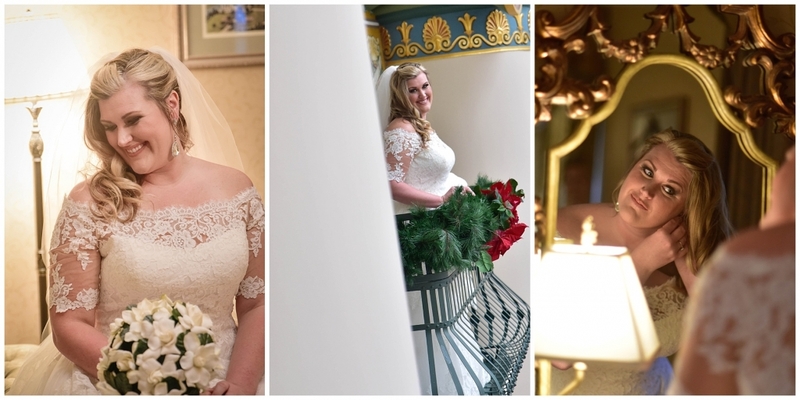 Ashley and Brett’s love story is best told through their wedding Christmas Carol (video) from Eyenamics Wedding Video Story Ashley and Brett. 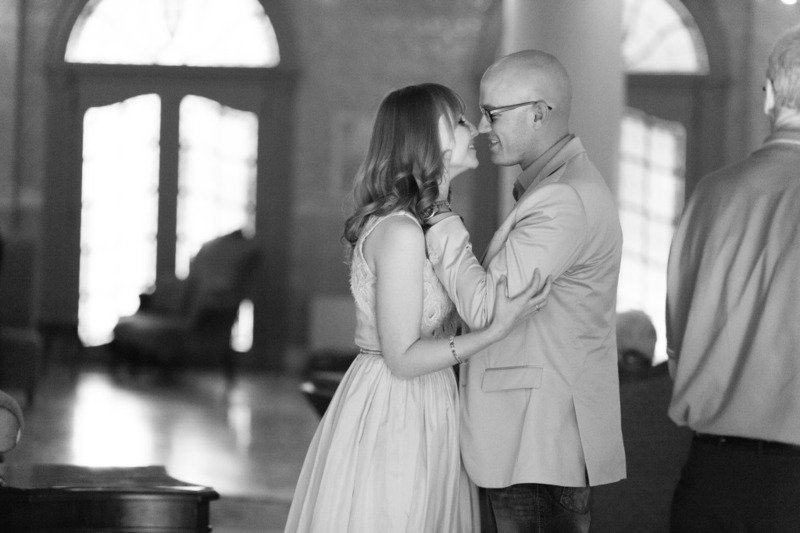 This video is undoubtedly the most emotional I’ve had for a wedding…. and so was their weekend. Emotional, loving and entirely full of happy tears. Ashley had been a bridesmaid of mine in previous weddings, so it was delightful to reconnect this time for her own celebration. 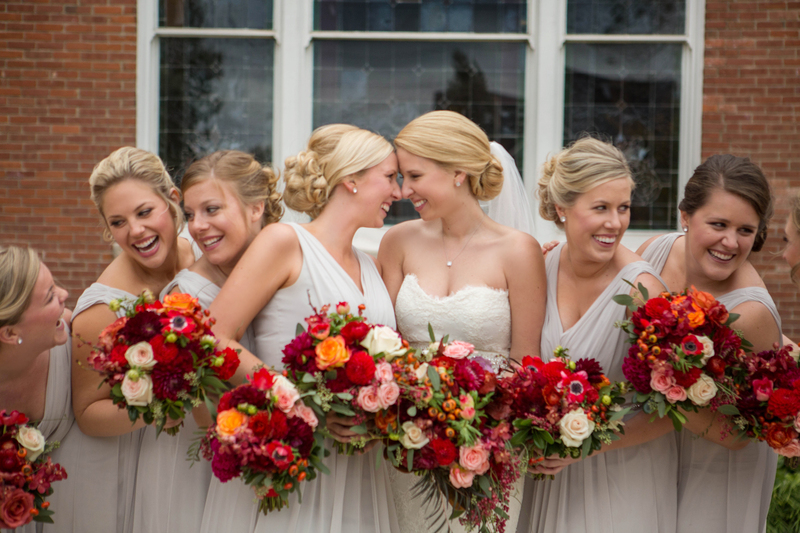 She wanted her wedding to center on family, family, family (and Christmas!) We made sure it did. The ceremony included involving Brett’s sons and was very emotional. 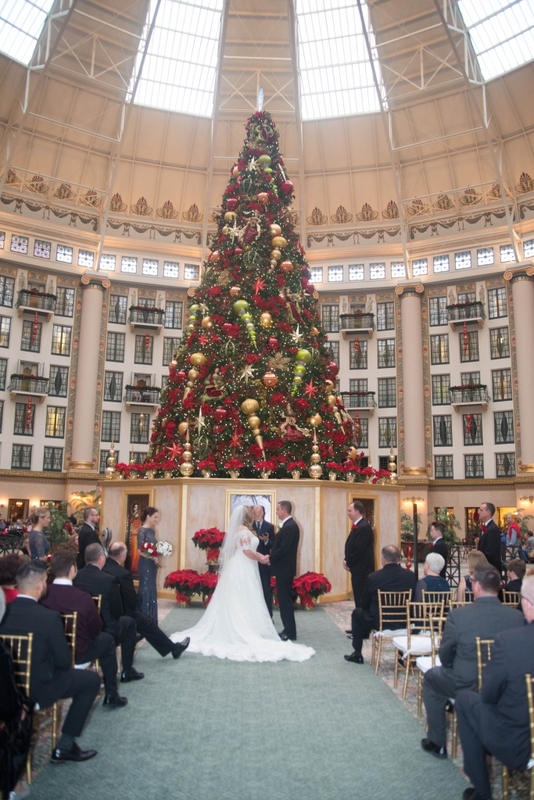 It took place at the base of the West Baden Springs Hotel’s enormous tree, and Ashley got ready for her wedding day while carolers strolled through the grand atrium. 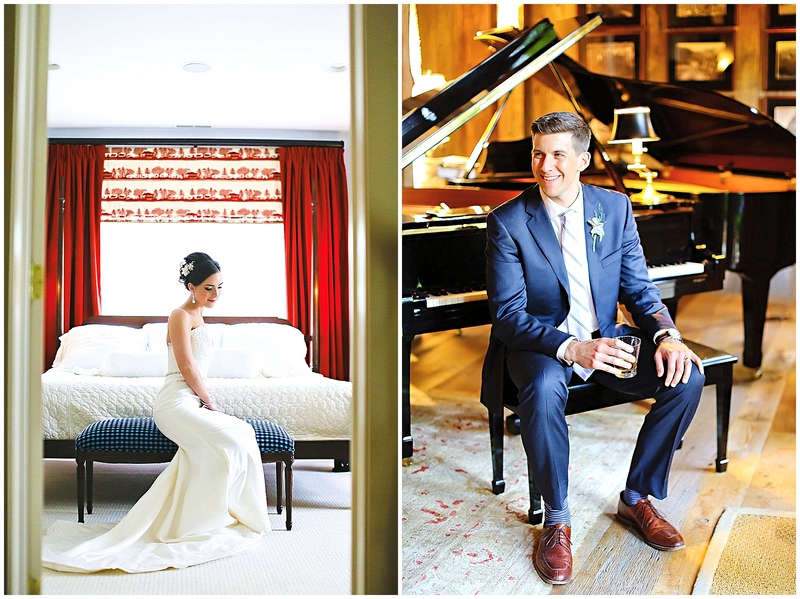 The serenity of their voices calmed any nerves a would-be bride might have. Little details of Ashley and Brett’s day included personalized ornaments and a children’s area that made Santa’s workshop seem like child’s play, (the kids even got to make their own stuffed animals while decorating cookies!) 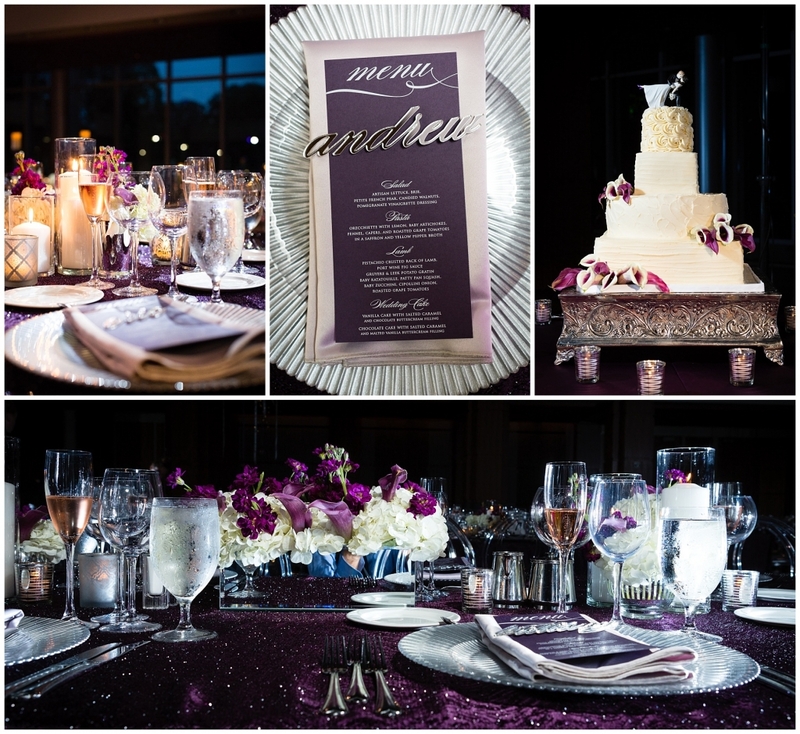 Ashley and Brett thought of everything and wanted their wedding celebration to truly be a relaxing retreat before the holiday weekend. 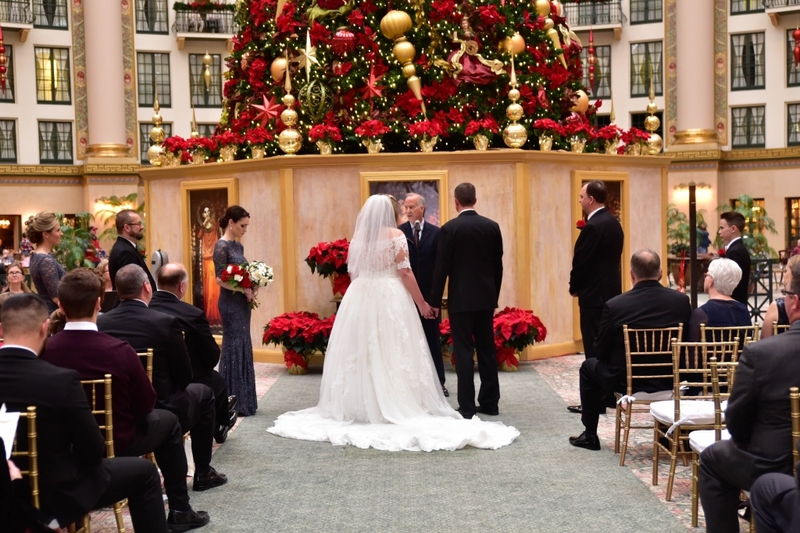 They wanted their new family to celebrate with family from around the country in one of nation’s most beautiful locations and enjoy all the Christmas magic it offered. 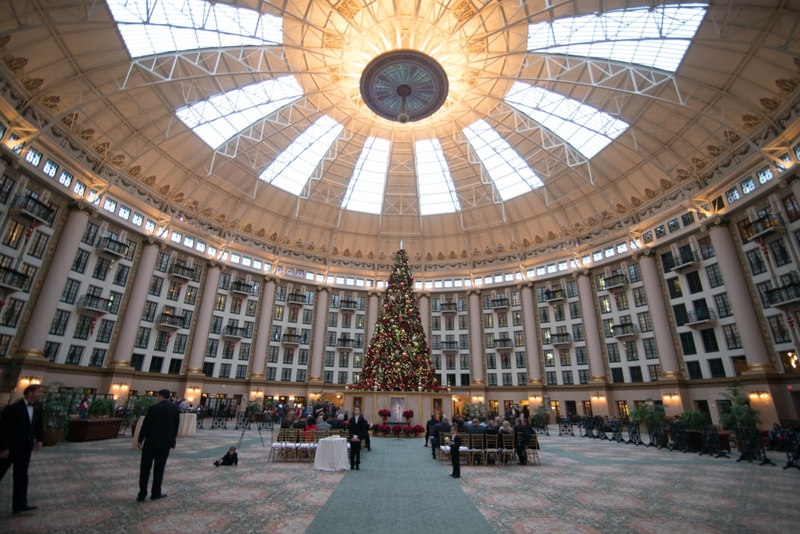 (…and let’s be honest, the West Baden Springs Hotel is stunning anytime, but there’s just a little something extraordinary about it during the holidays.) It was truly an honor to help create this for the new family. 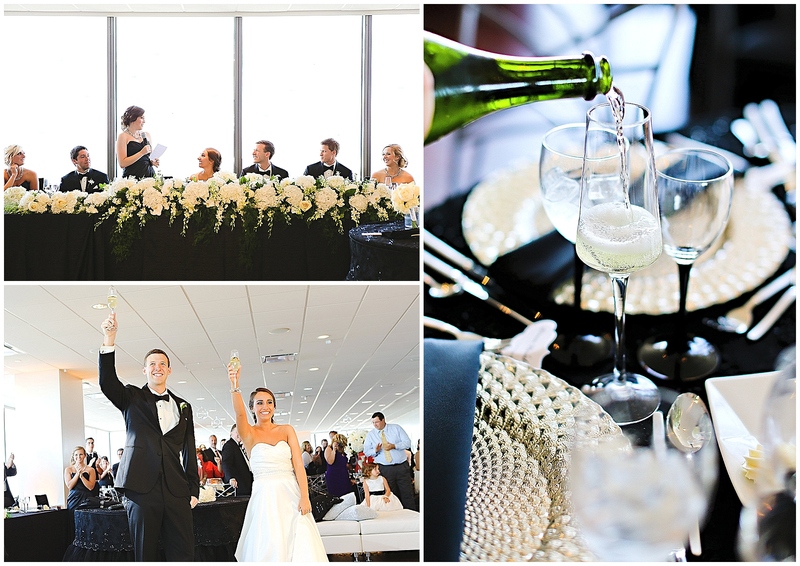 2014 was an amazing year full of families who openly welcomed Mon Amie Events, Inc into their lives to plan their weddings and events. Some of these couples actually were siblings of others I’ve assisted in the past and it was wonderful to help another family member down the same aisle. Others were new families who were warm and hospitable from the moment we first met. Regardless of how long I have known them, each of these families are forever part of my family – because they have made me part of theirs. As I look back on this incredibly memorable year I wanted to reflect on a few event images that really resonated with me. In the wedding industry certain photographs become iconic. There are some over the last 15 years that just “stick” – clients, professionals and fellow industry colleagues know “that wedding” from a particular photograph, but in actuality another image may be the moment that most resonates in my memory and my mind’s eye from the day. 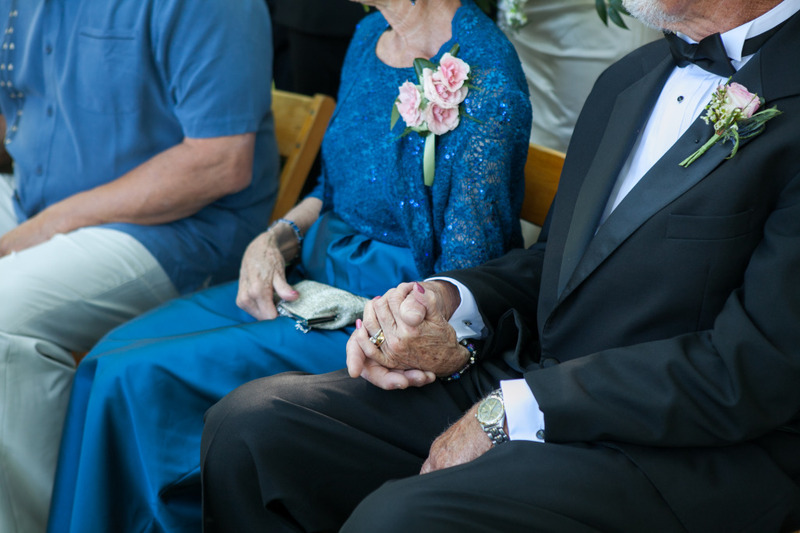 They are the quiet moments, the memories and the emotional parts of the day that I most remember as the couple’s planner, the family’s advocate and the observer on the day. Here now are my 14 favorite “unsung” images of 2014. 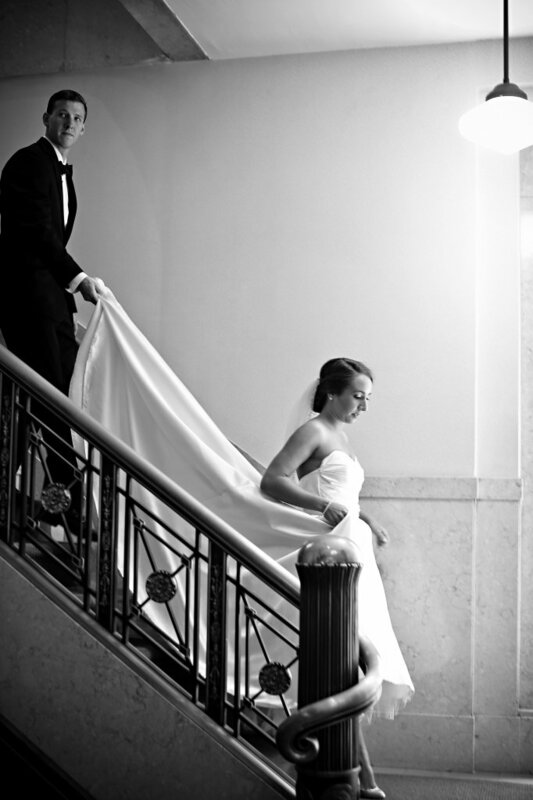 “The Staircase” — I love this quiet moment as Curtis and his bride Sara head out to take photos the morning of their wedding. 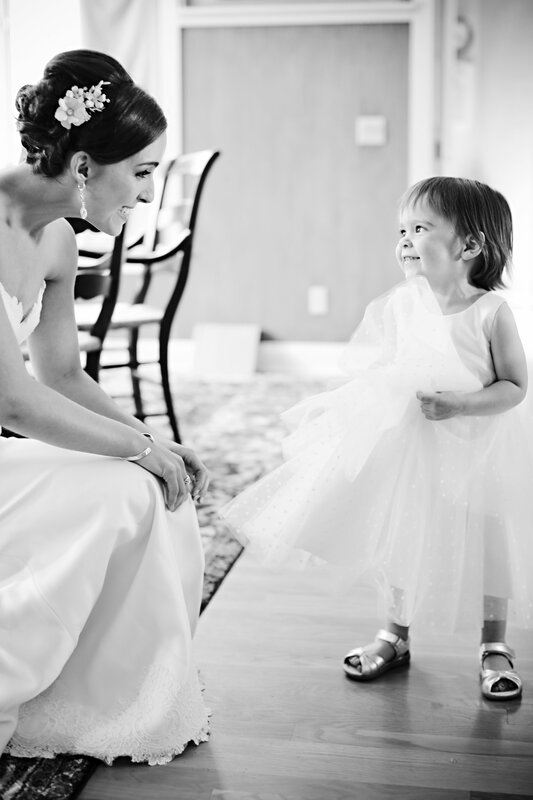 “Deep Conversation” — Only Shelby and her beautiful niece know what they were conversing about while the girls were getting ready, but his moment is one of my favorites from this May wedding. 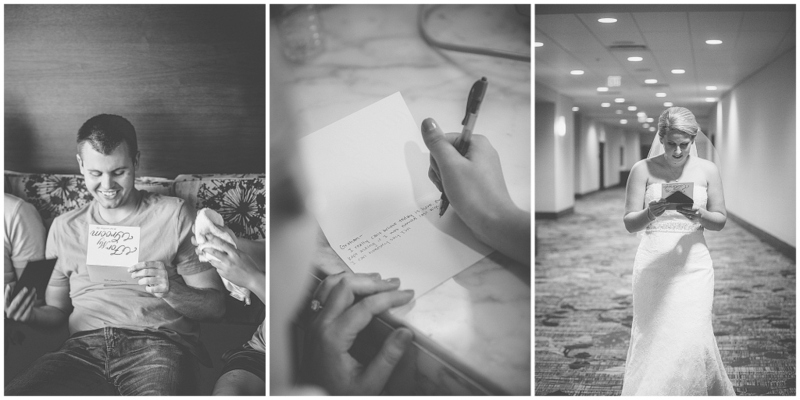 “Love Letters” – Many couples exchange letters before seeing one another – and I do everything possible to ensure this moment is captured on film. If nothing more so to have THIS moment on film so Graham’s wife, Grace, can see it. I think he looks so handsome as he is reading her words and she deserves to see how happy she is clearly making him. I think the mood is beautifully captured here in black and white. 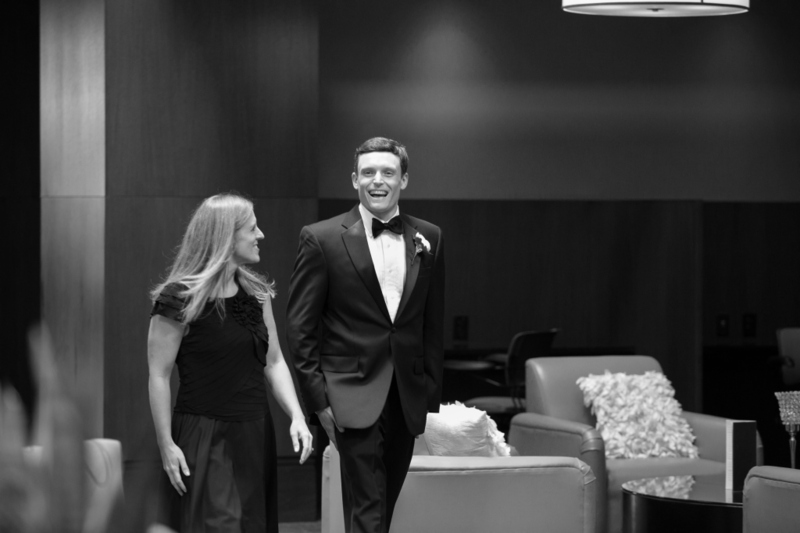 “Anticipation” — Matt can not contain his smile as we’re walking to go see his bride, Abby, for their first look. What absolute joy is expressed everywhere – it’s a magical part of the day! 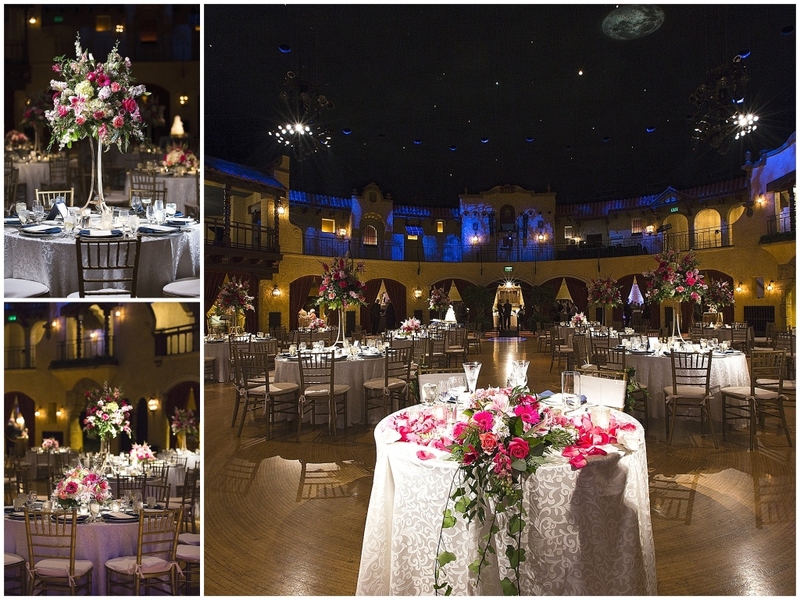 “Final Prep” – In the overall room decor and awe inspiring room shots that we all admire in the event industry, I fear too often people fail to notice the dozens of hands it took to make the amazing details happen. I love this image of one of the staff piping butter before a wedding onto the bread plates. Every member of the team taking such pride in their work for the happy couple. “Here Comes Our Friend!” – I love this sweet moment during the bridal processional as one Grace’s bridesmaids quickly looks at the other bridesmaids as if to say “look there’s our friend … getting married!” You can see the other bridesmaids behind her beaming at Grace coming down the aisle, but I love this quick glance as if to say “is this real? !” She looks so happy, giddy and proud! “Mimi and Papa” – This June Mimi and Papa hosted their granddaughter, Lauren’s wedding on their farm in Southern Indiana. 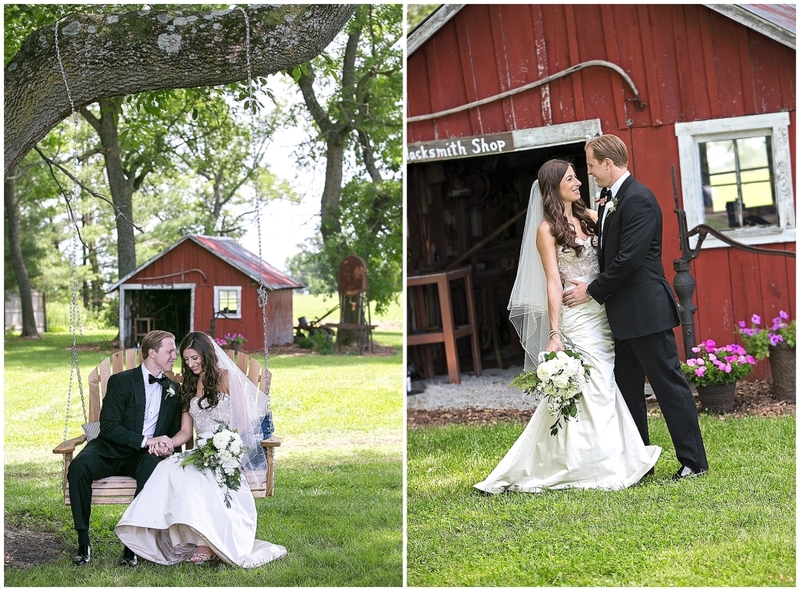 They were gracious, hospitable, warm and so in love with Lauren, and one another. I love this moment taken during the ceremony as Lauren and her husband Tom said their vows on the family farm. 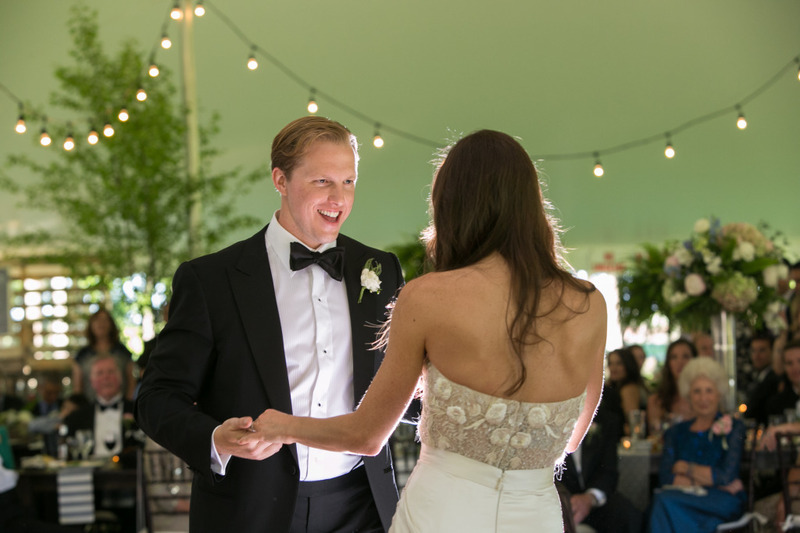 “Connection” – Tom and Lauren didn’t tell anyone what their first dance song was, except the band. 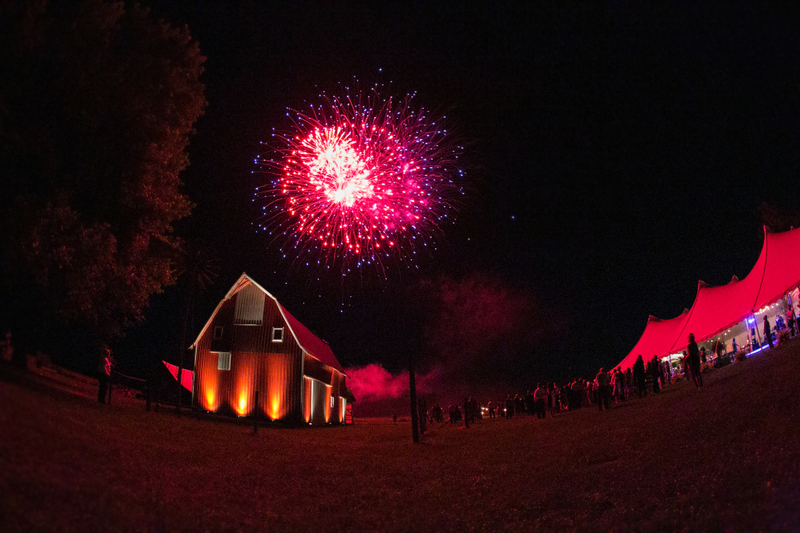 So when they came out and lit up the dance floor – it was amazing! I love the way Tom’s looking at Lauren. They’re clearly having fun, making a connection and about to have a great night – which is what a wedding is all about! 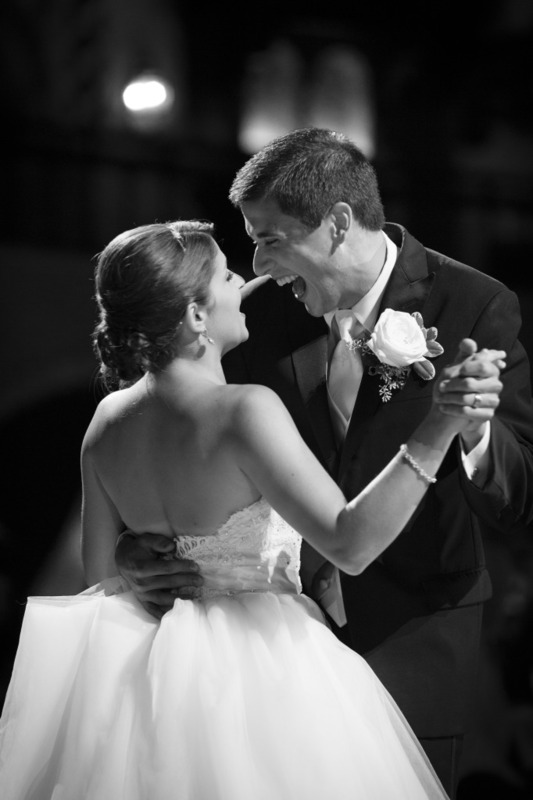 “We’re Married!” – If you think this smile on David’s face during their first dance was a quickly stolen moment, or a laugh perfectly captured, you’d be wrong. He laughed, smiled and looked into Kelesey’s eyes all.night.long! It was fantastic! 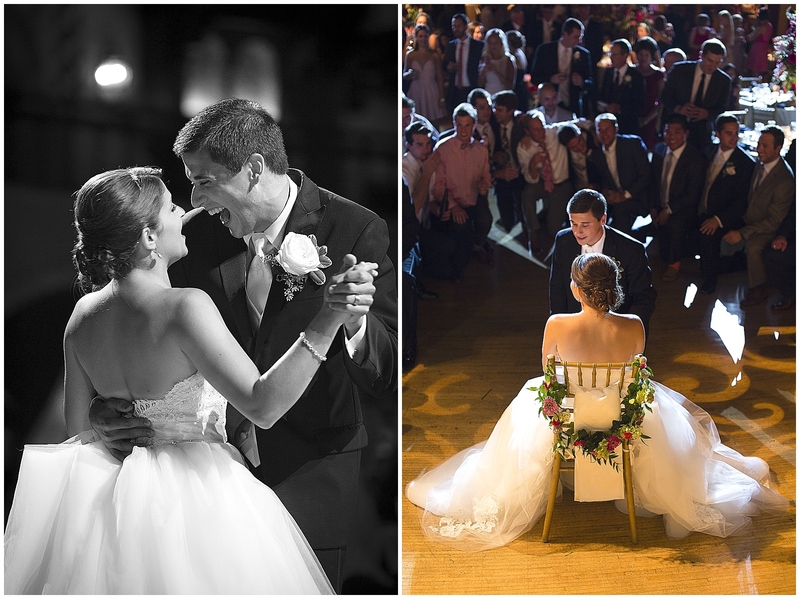 Tiffany Stoner, one of the photographers commented in her career she had never seen a groom so in love. They were so easy to photograph together because they radiated joy. “Candlelight” – In her father’s memory Lauren’s traditional father – daughter dance consisted of several influential men in her life dancing with Lauren to the classic “In My Life” while all of the guests encircled the dance floor holding candles which remained lit the remainder of the evening. The last person to dance with her was her brother (pictured) and as the song ended, the guests spontaneously raised their candles to the sky above. How this photo was taken with the tears flowing behind the camera were possible is still beyond compression. “Momma is So Proud” – I love Sheila. Everyone who meets her does. How can you look at this woman and not? She’s clearly beaming with pride at her son during a stolen moment on the dancefloor! “Taking it all in.” – Brian enjoying his Scotch. Brian just savored the day, and his Scotch. He relished in the entire experience of being a groom. He loved hosting the wedding in his family’s beautiful lodge, looking at his stunning bride, greeting his guests and just being the groom. 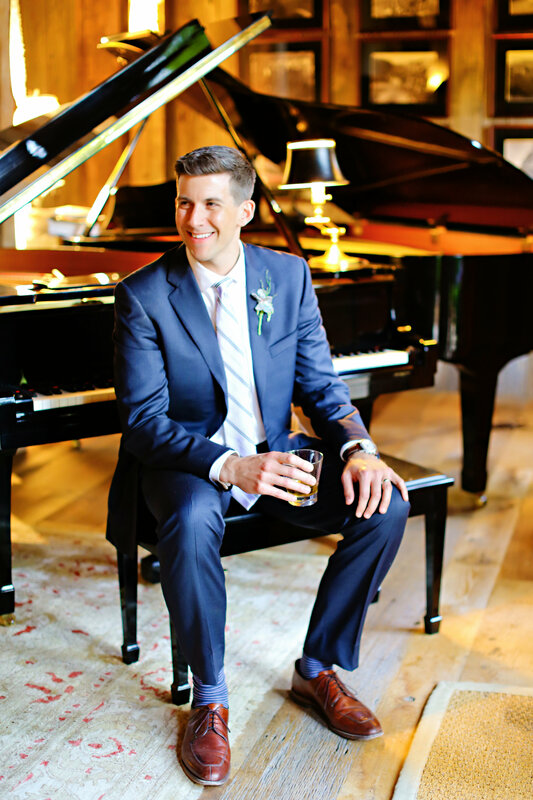 Brian really is the prefect gentlemen and this photo captured the mood, and his spirit perfectly! 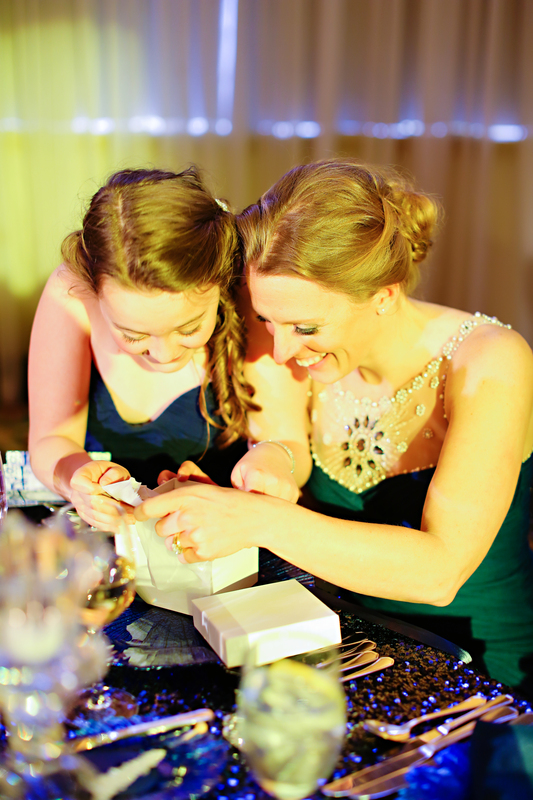 “Opening Presents” – There is nothing like the magic of opening gifts – the anticipation and joy! Just like the gift of a new year. Thank you for this gift of 2014. Here’s to the gift of 2015 – Cheers! 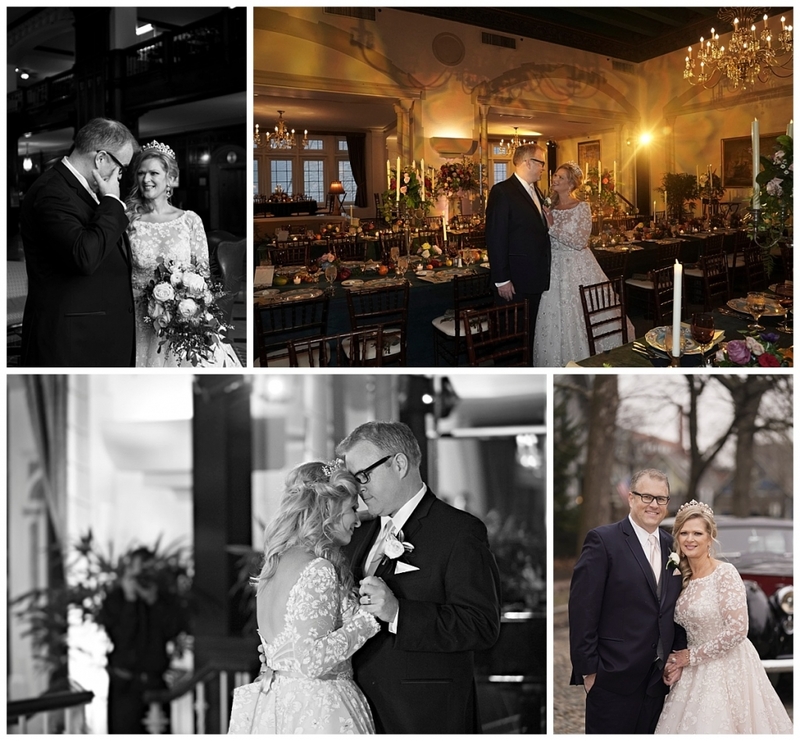 Special Thanks to: Conforti Photography, Jennifer Driscoll Photography, Nathaniel Edmunds Photography and Jessica Strickland Photography for capturing a year full of intimate memories! I have loved seeing 2014 through your camera. 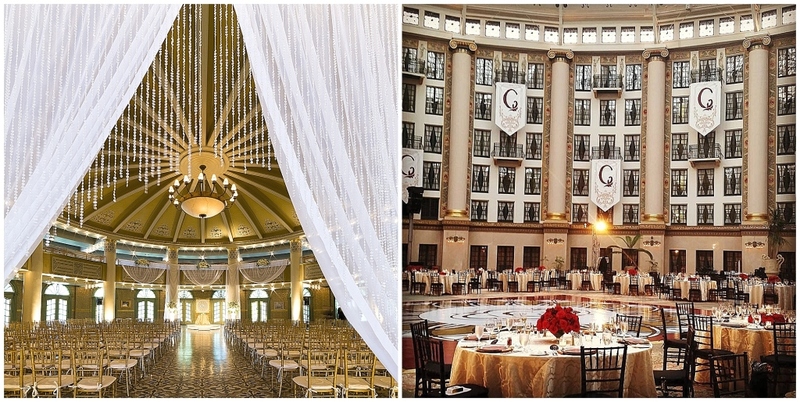 Anyone who knows me outside the event world knows I call the West Baden Springs Hotel in the French Lick Resort “Mecca” – many who know me inside the wedding world know it too. I love the rolling countryside of the Southern Indiana hills as you approach. I love the iconic yellow brick beacon that appears like a mirage out of the countryside. I love the stunning architecture that sweeps stories into the sky. I love the attention to detail in each space from the library, to the dining room, to the spa, to each guestroom. Above all, I love the guest service. 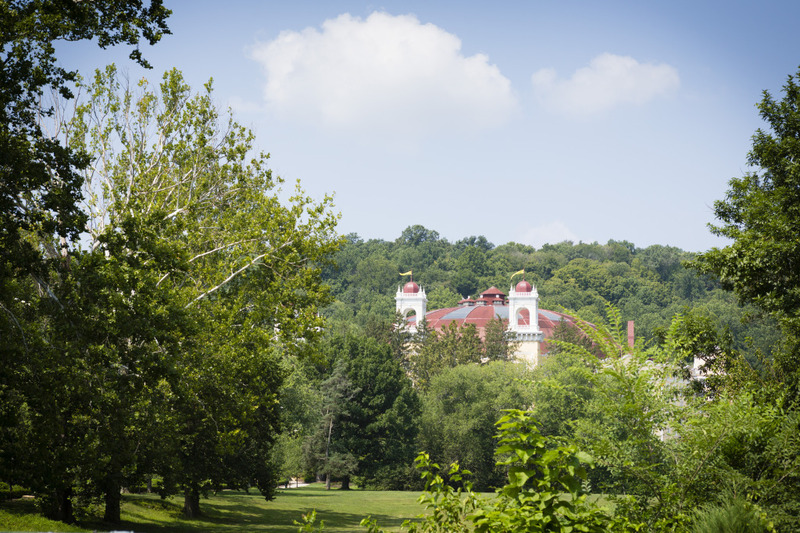 I love West Baden. I make no secret about it. When Lauren first called and told me she was getting married in Mecca I knew we were destined to work together. She and my son share a birthday, she adores roller coasters, she’s a Florida State Seminole (I think I was one in another life – because although I am an IU Hoosier, I – due to many family ties, cheer for the ‘Noles during football season – much to my Notre Dame loving husband’s dismay) and, Lauren always knew she would get married at West Baden. So when we first met on a fireworks cruise at Walt Disney World, we instantly clicked. 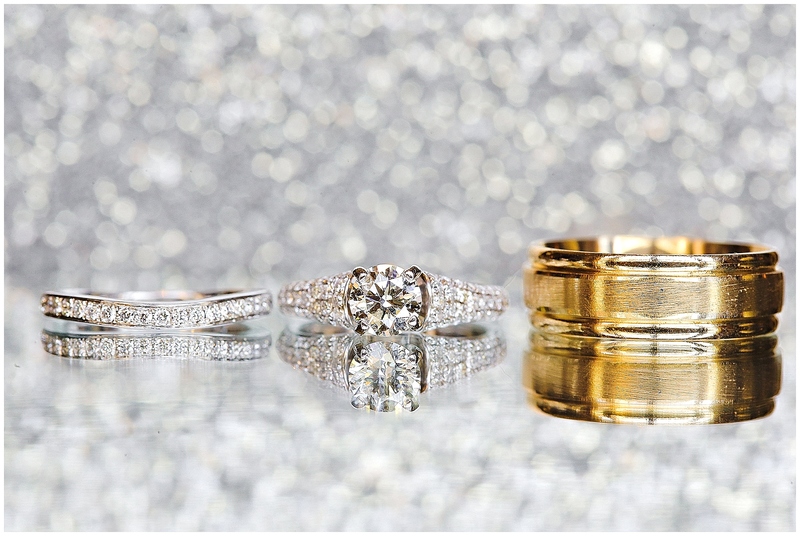 In fact, Lauren first wanted a black, white and gold wedding. Just after we began working together, I designed a cover shoot for a magazine at West Baden, and inspired by the touches of deep crimson throughout the hotel, I used gold and red in the photo shoot. 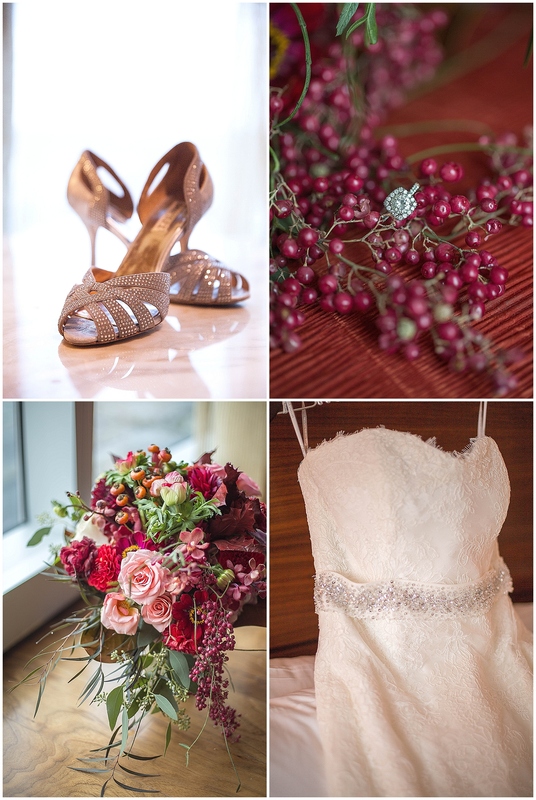 Suddenly, Lauren wanted to change her colors to gold, garnet and black for the reception and for the ceremony we would maintain white and gold palette. Knowing West Baden’s gardens and enchanted spaces as well as she does, I was not the least bit surprised Lauren requested photos outside of this idyllic location on their stunning summer day. 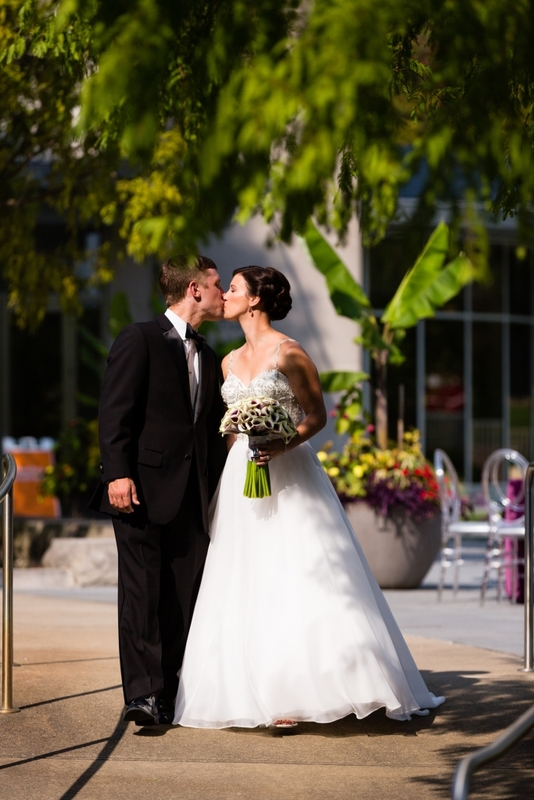 It was perfect outside – a lovely breeze, perfect shade and look what Mother Nature gave them for these perfect photos! 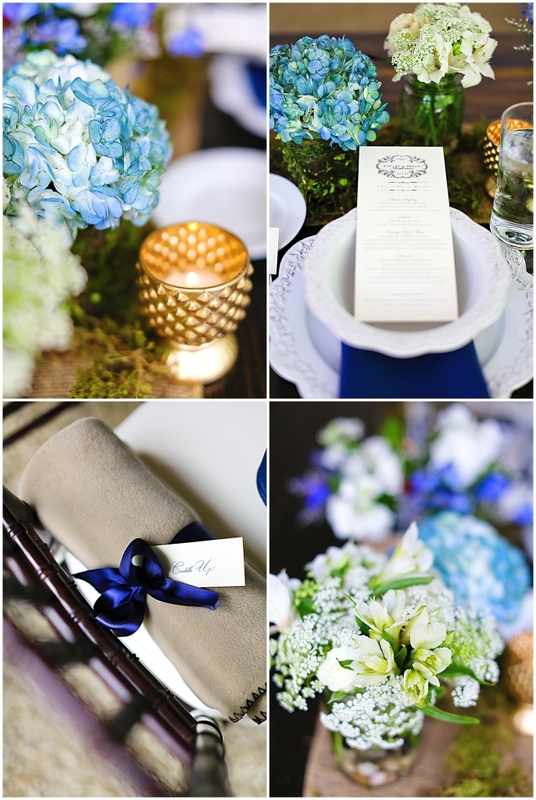 The look of the wedding began with the paperie all created by pomp&polish. 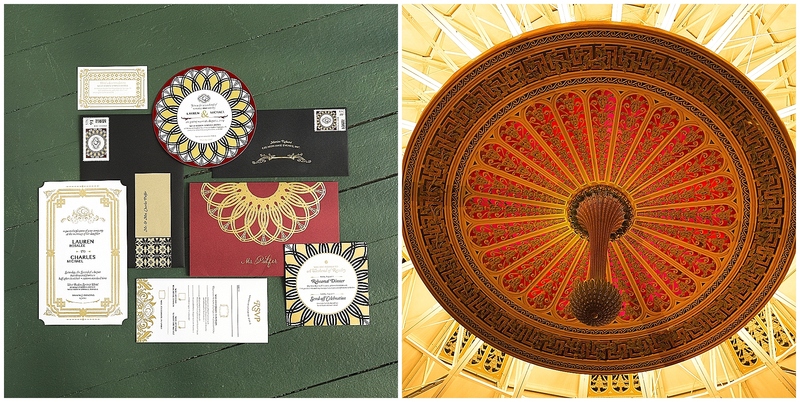 Nikki Pulfer from pomp&polish designed the save the date and invitations after being inspired by the medallion in the atrium’s grand dome. 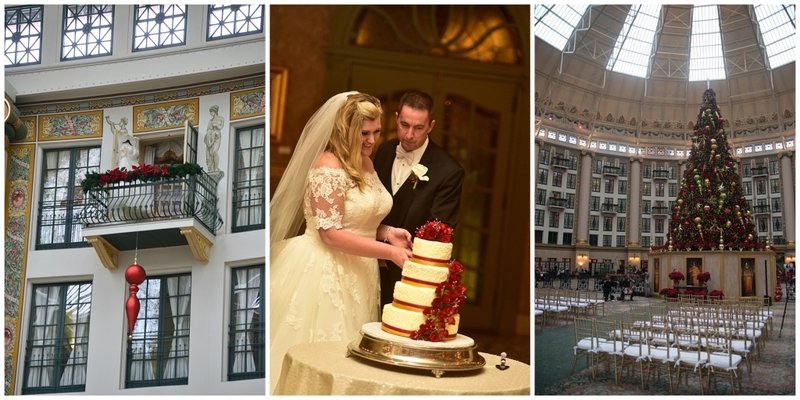 She then created a suite to highlight West Baden’s architecture, even including intricate details from the tiles of the floors, all of which were later used on the wedding day paper suite. 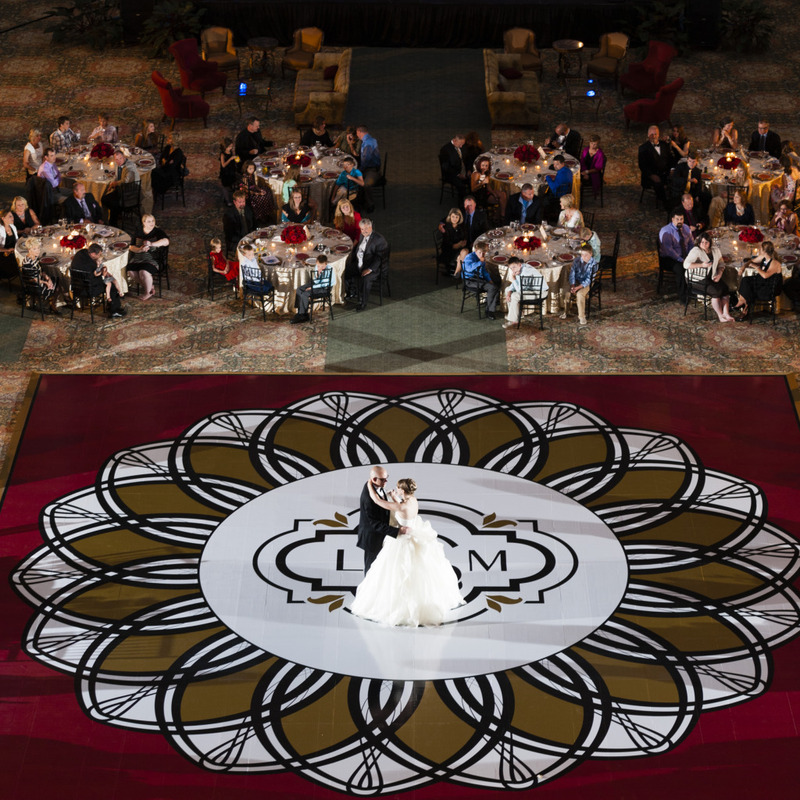 The main medallion would hold the largest surprise for the guests – it would be used as the design for the 36ft dance floor. To complete the look she used a beautiful foil stamping technique and gold calligraphy that gave the invitations a sheen and regal elegance. Lauren and Michael may have hosted their wedding in a grand and opulent hotel, but don’t let the size of their wedding allow you to think it was anything less than an intimate occasion. 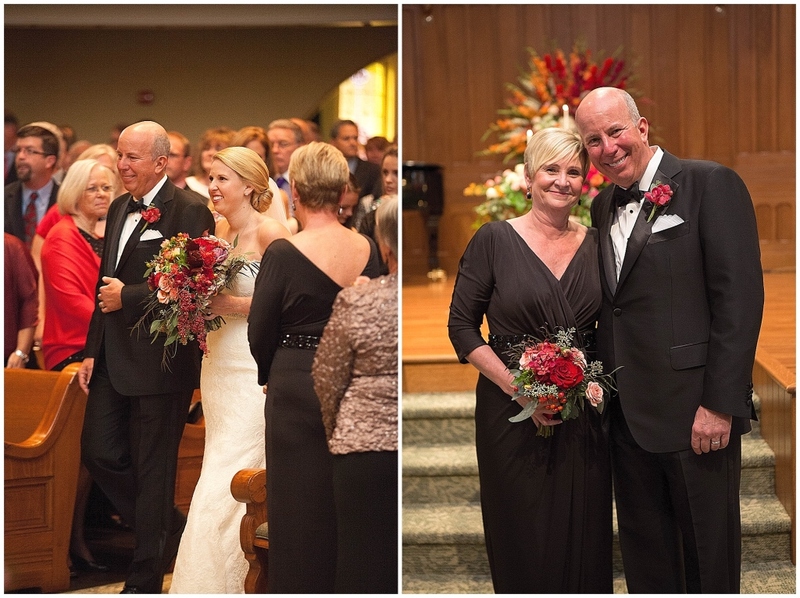 It was definitely a family affair filled with love, laughter and plenty of family stories to tell. 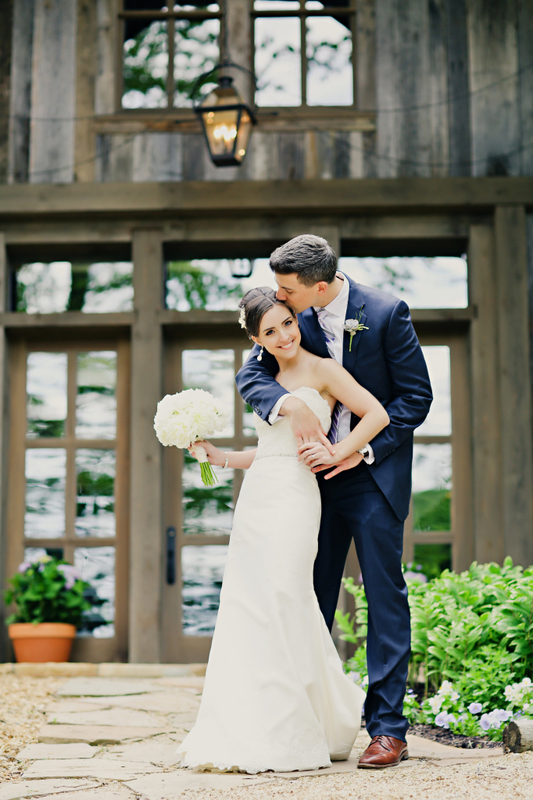 Lauren and Michael wanted their guests to enjoy a wedding weekend to retreat, relax and indulge in celebration in one of Lauren’ favorite childhood destinations. 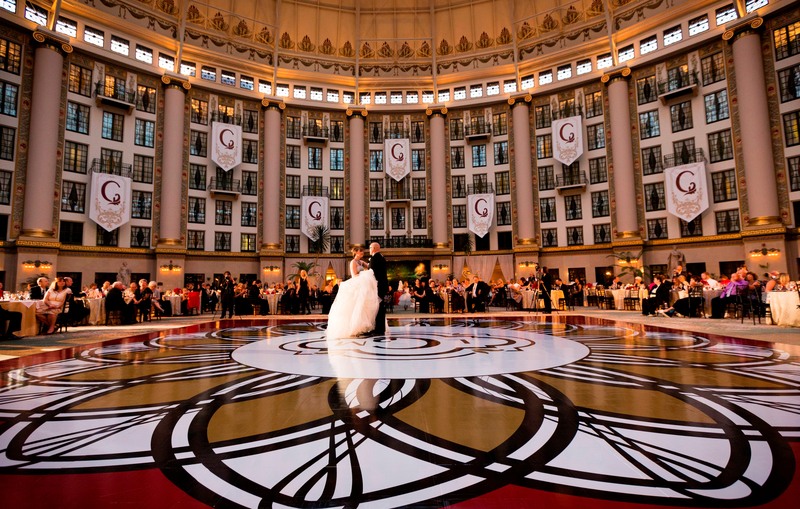 During her wedding trailer video, she talked about how she had long envisioned her wedding taking place at West Baden, and it was a joy to see her guests revel in seeing her dream become a reality. 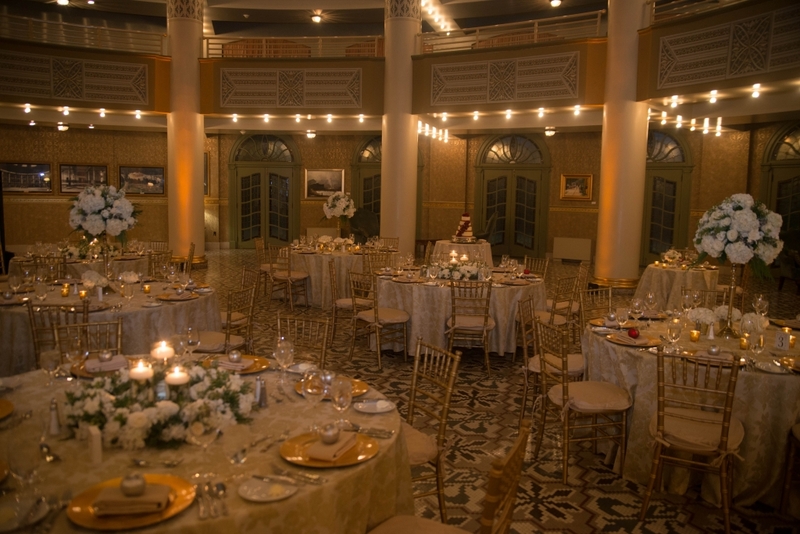 The ethereal ceremony took place in the grand lobby surrounded in cream, snowy white and soft dewy flowers. 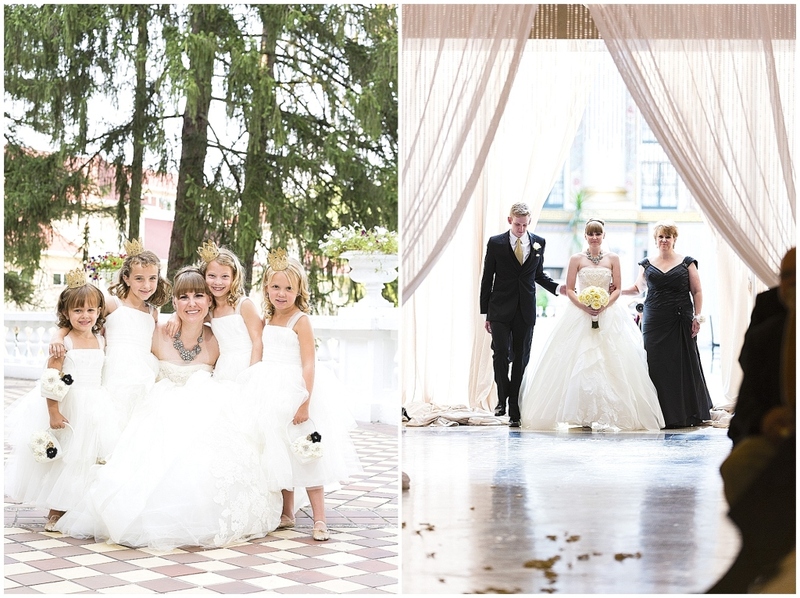 Dainty flower girls floated down the aisle with adorable crowns, ring bearers – dressed as “security guards” complete with ear pieces and sun glasses arrived just before the ring itself and the service started with an atmosphere of sheer joy! 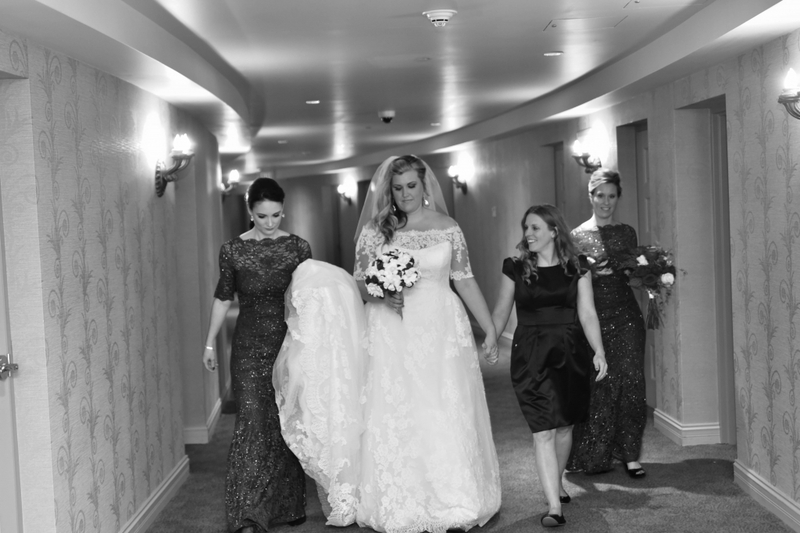 As Lauren, escorted by her mom and brother came down the aisle, the mood was light and celebratory! Lauren walked into the ceremony through an crystal and organza curtain (a surprise to her!) 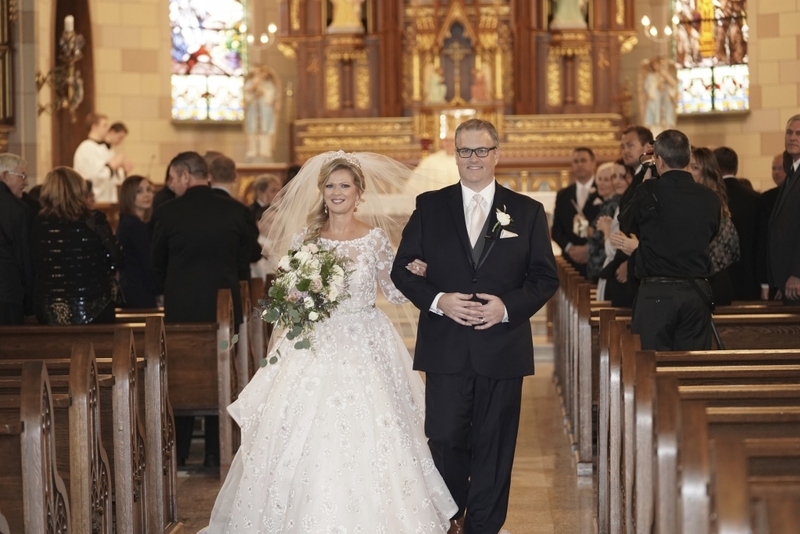 and glided up the aisle in her Vera Wang gown. The ceremony, led by their hometown pastor, included prayers from her parents’ ceremony and ended with steamers of flutter fetti as the couple was announced husband and wife! Personal touches in the ceremony were everywhere. From the prayers and songs selected during the vows, to the heart sewn into Lauren’s gown in honor of her late father ~ this truly was an intimate family wedding. Family and friends enjoyed cocktails along the porte cochere where carriages have brought hotel guests for over 100 years. 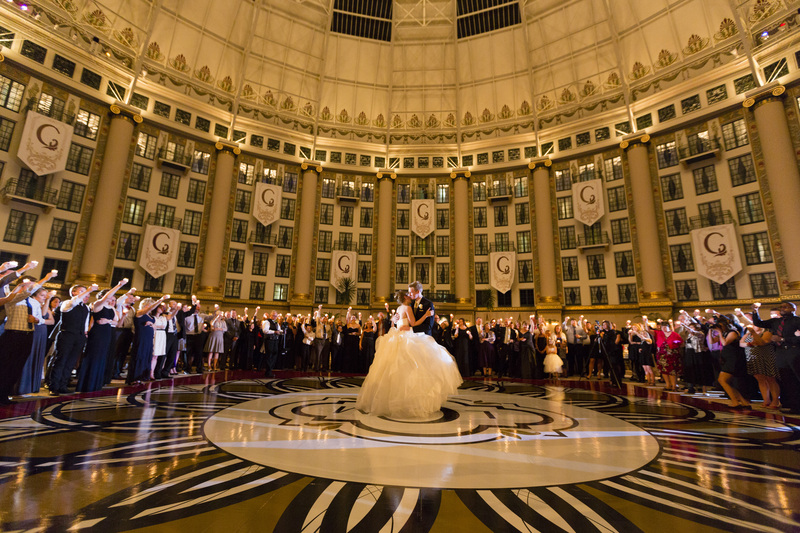 Finally, dripping with anticipation, the guests were allowed to see main 200′ diameter atrium for the first time. 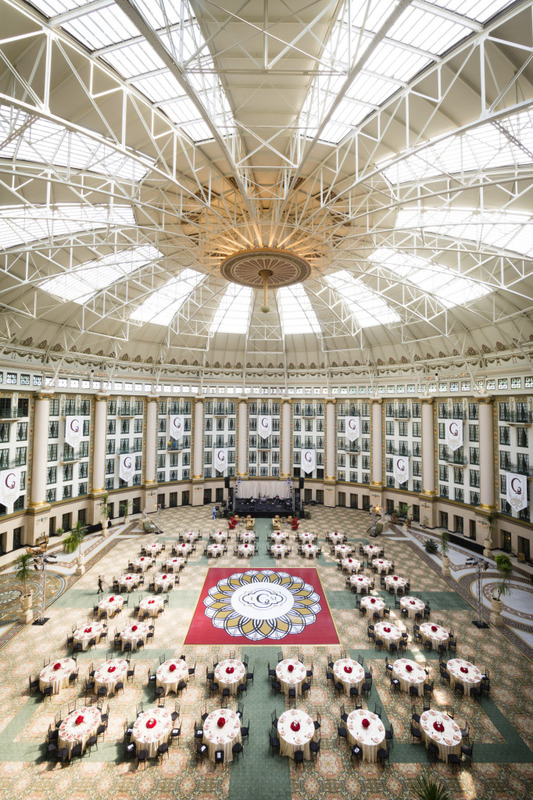 The sun-drenched dome radiated with sunlight as guests were seated for dinner. 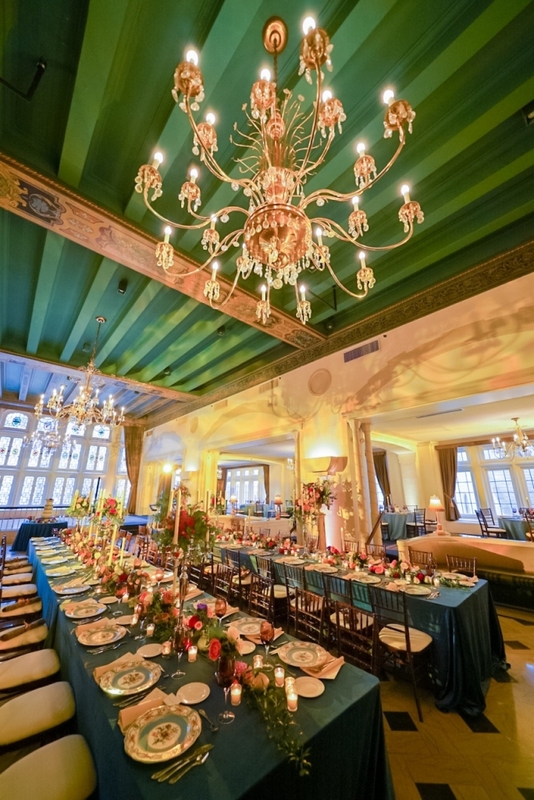 Before them hung a ring of monogrammed banners and a custom dance floor stretched the expanse of the ceiling’s medallion. 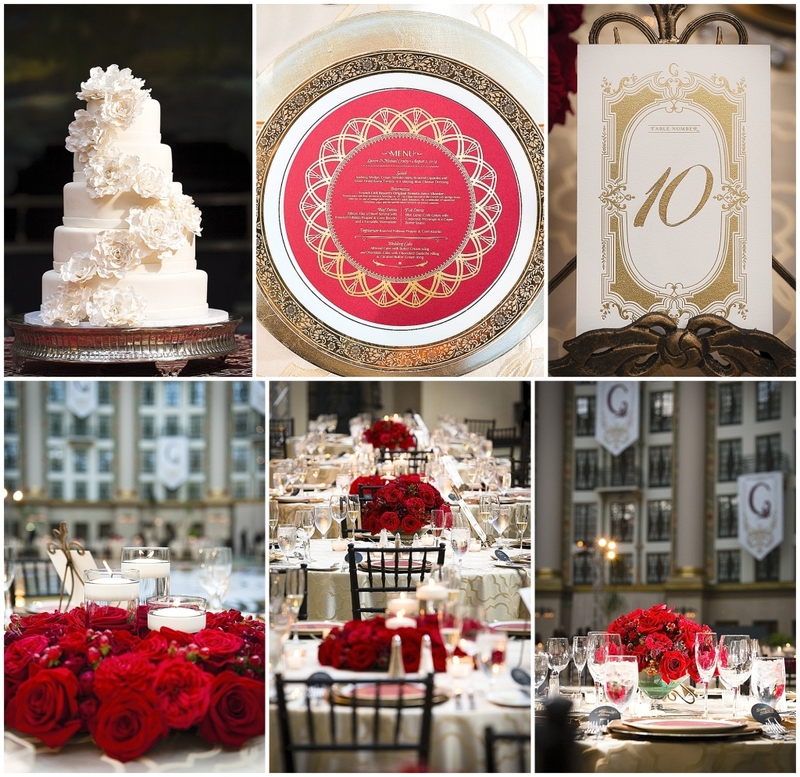 Soft gold linens and deep crimson florals perfectly suited Lauren and Michael’s subtle nod to Florida State and West Baden’s color palette. The details were everywhere! Gold chargers and gold rimmed china set off the garnet and gold foil stamped menu cards. Children even had their own coloring page of the ceiling’s medallion to occupy them during the evening. A cake (almost) too beautiful to eat stood stately in front of the grand fireplace that once burned 14′ logs. Hand painted table numbers which were so detailed one guest even asked to take it home – (an unexpected requested from an elderly man, I must admit) 😉 and robust red flowers in low containers, so guests could converse easily and marvel at the banners overhead. 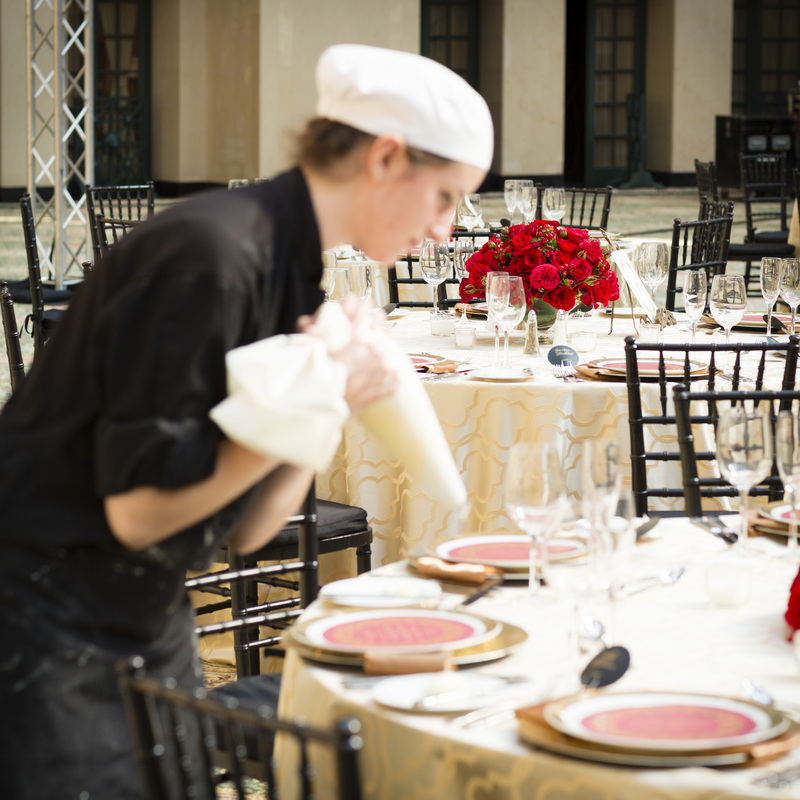 Lauren and Michael wanted every detail to be preserved so they even had a painter capture the day for them during the event. 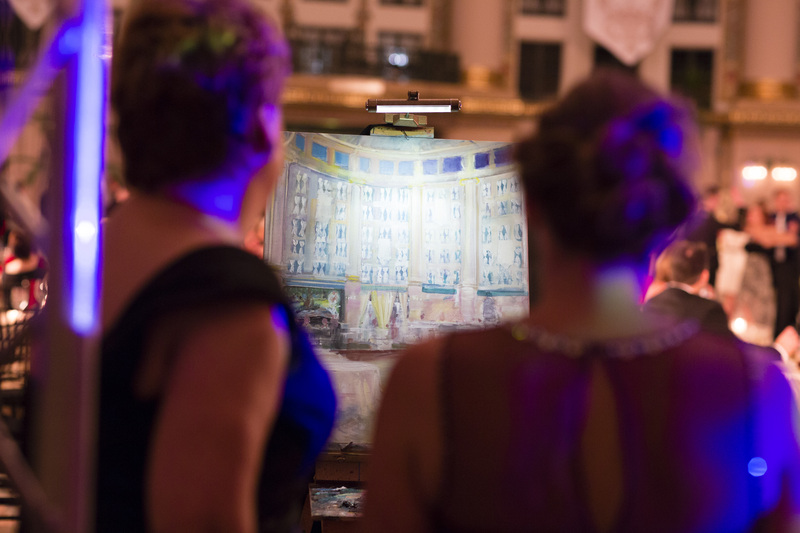 In the ballroom he quietly painted the entire event as it unfolded. Guests could be seen going over throughout the night checking in on the work in progress. 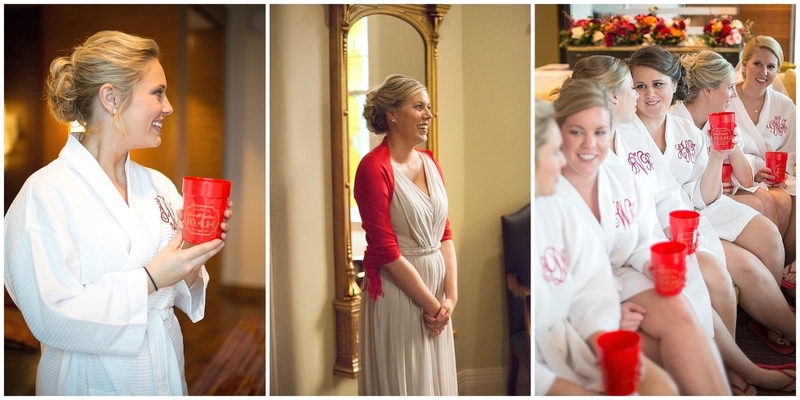 Two of the highlights of the day were actually surprises to Lauren and happened during the reception. 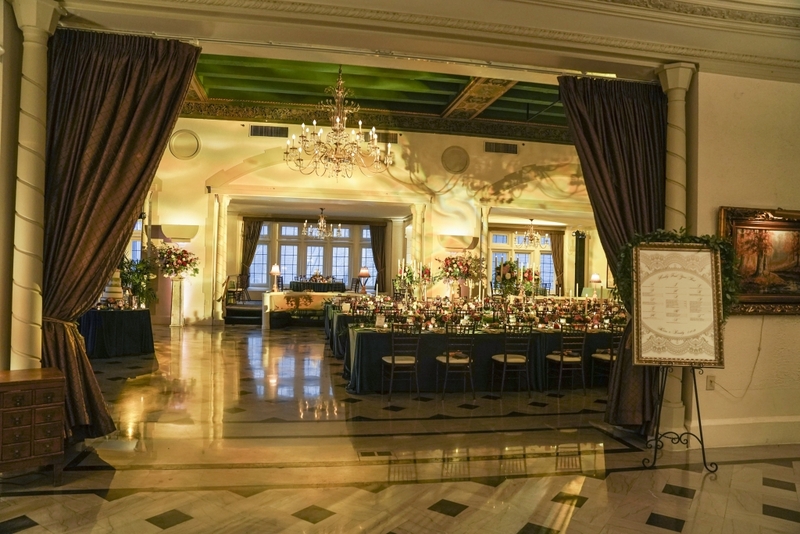 Lauren’s traditional father – daughter dance consisted of several influential men in her life dancing with Lauren to the classic “In My Life” while all of the guests encircled the dance floor holding candles which remained lit the remainder of the evening. The dance floor was FULL the entire night due to an incredible band, fun atmosphere and a great group of people! They were dancers! 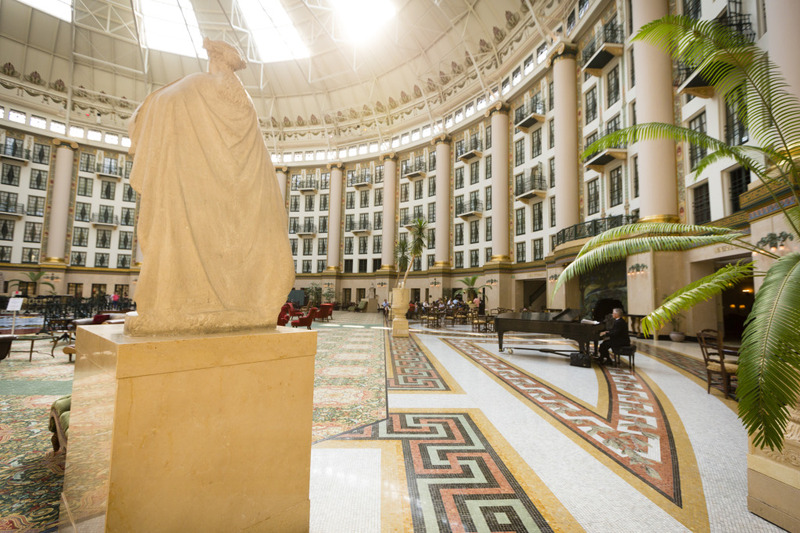 It was really refreshing and fun to see the West Baden Springs Hotel Atrium, normally so known for it’s opulent charm and quiet serenity, be so full of life and vivacious spirit! I adored working with the entire family! They are so warm and welcoming and have always treated my entire family as if we’ve known them forever. Above all, they always respected every professional on the team’s ideas with an open mind, and because of that, I think got a wedding beyond their wildest imagination! I love when couples do that – when they know any planner and any professional will only put forward ideas to help make their wedding vision grow and expand. 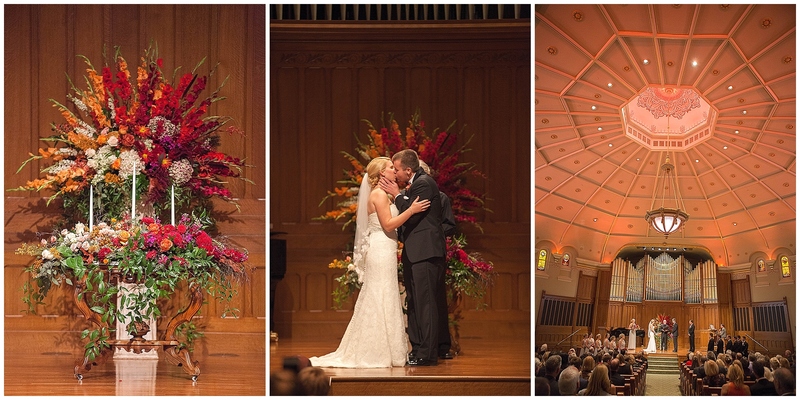 Lauren and Michael trusted their entire team and because of that, their entire team pushed the creative envelope. After telling her dad years earlier at Thanksgiving Dinner that she would be married at West Baden, Lauren always knew this day would come. It was a privilege to help make her vision become a reality. I hope this is everything she imagined and more. 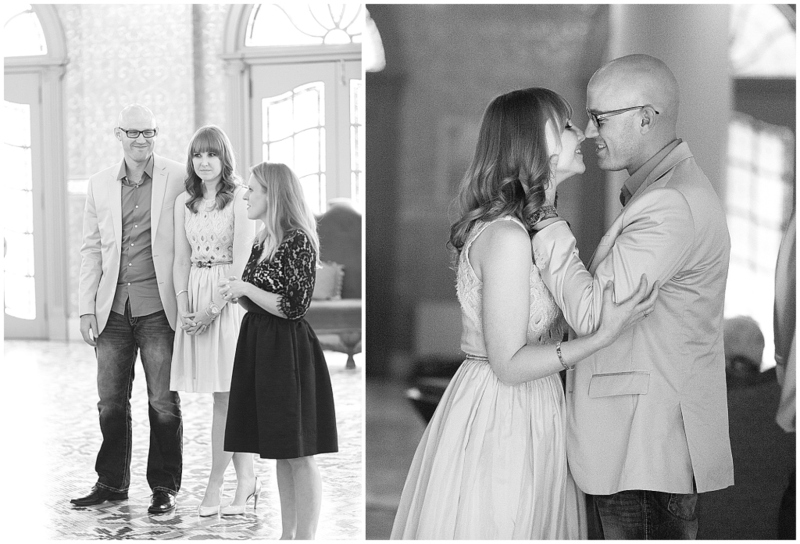 It really was a labor of love for me as a planner to help this beautiful couple in one of my favorite locations – Mecca. Now Lauren and Michael have a reason to call West Baden Mecca too. 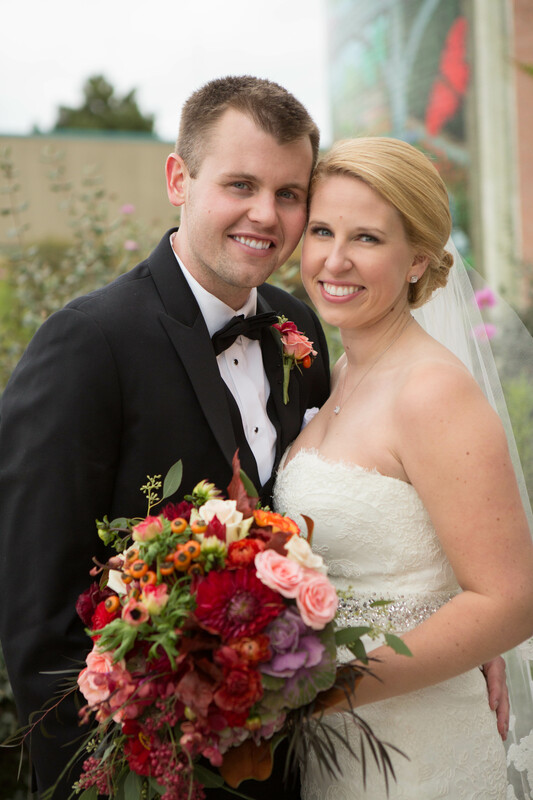 Kelsey and David had their priorities straight from the onset of their engagement – the ceremony was the focal point of their grand affair. It was lovely to witness this as their wedding planner! 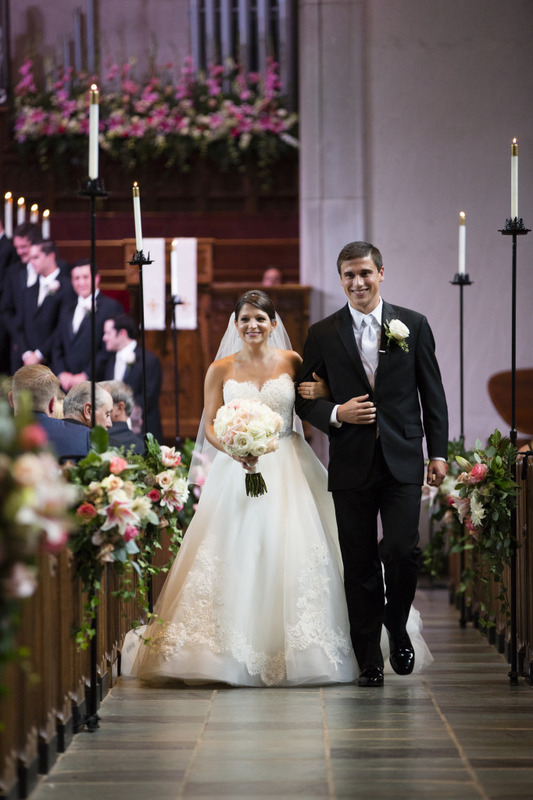 Kelsey was the third daughter to get married at Second Presbyterian Church, the iconic marble church located on Meridian Street. 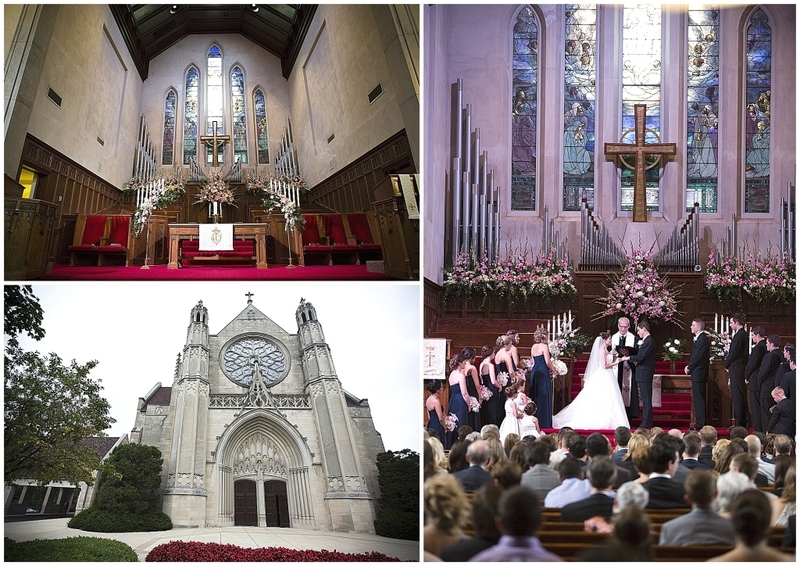 To highlight this spectacular church and the beautiful architecture Kelsey, and her mom, Cindy, requested gorgeous pale pink and white flowers drip from the massive altar where Kelsey and David would say their vows. They were spectacular! When Cindy first arrived to the church she gasped! It was one of my favorite moments of the day! 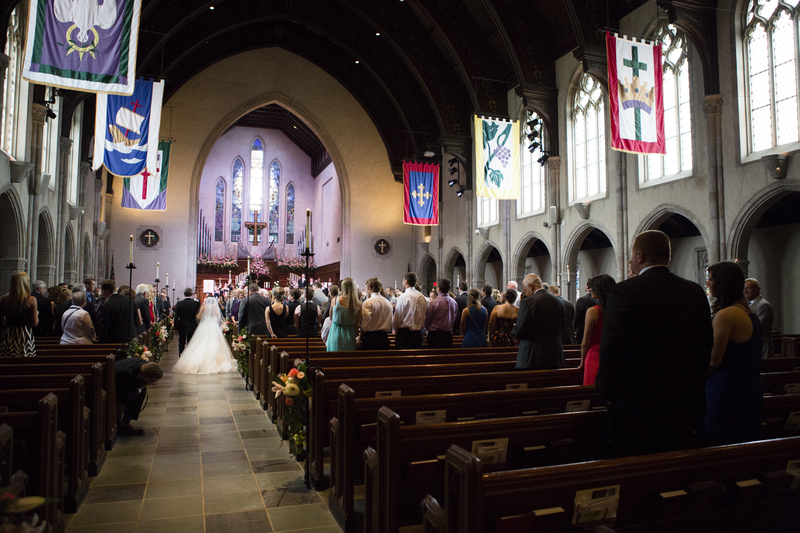 To compliment the decor, Kelsey and David had a variety of music throughout the ceremony including a quartet, a children choir and her brother singing The Lord’s Prayer. It was a joyous and family filled celebration. 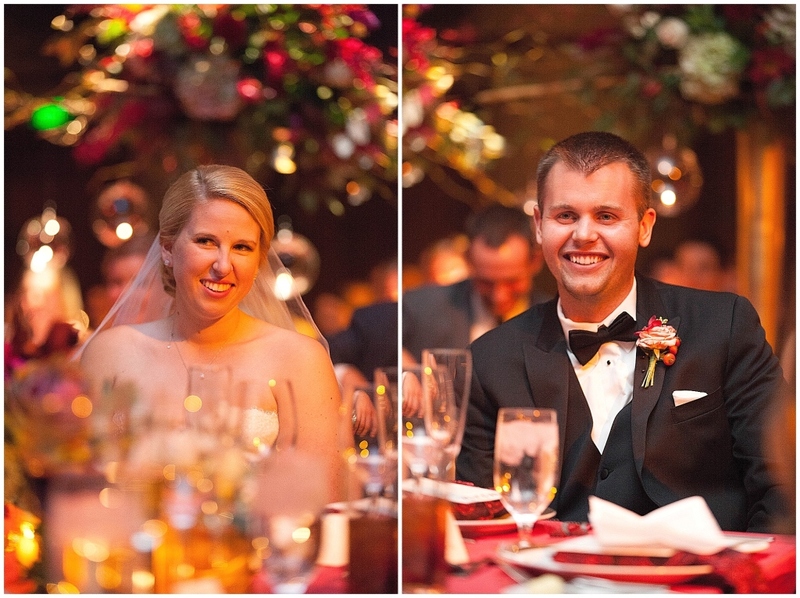 Seeing David’s face at both their first look and when Kelsey came down the aisle really says it all. He had waited years for this moment and he could hardly contain himself – he smiled from ear to ear all day! 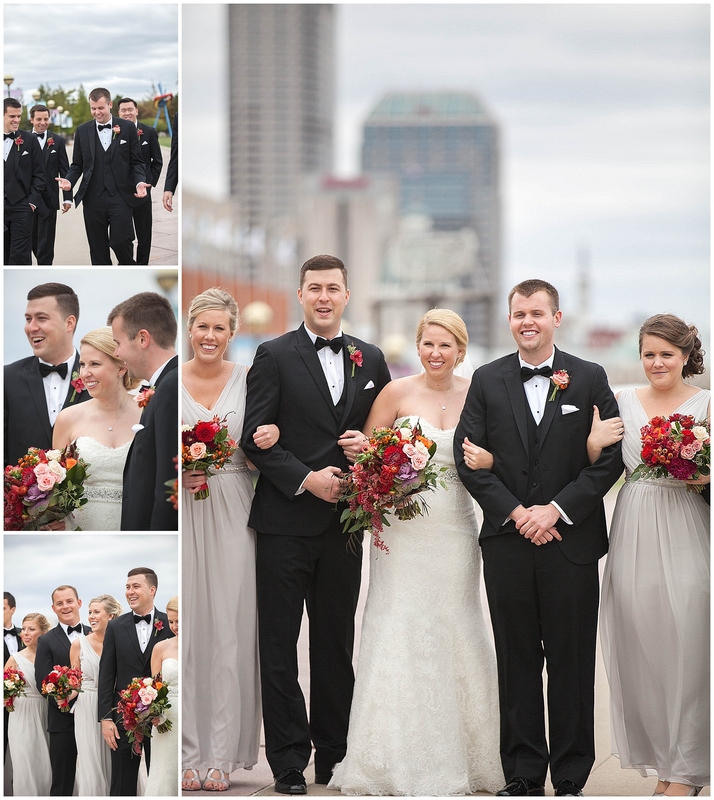 Their love was evident the entire day as they took photos in downtown and couldn’t have had more fun doing so. They laughed, smiled and relished in the entire day’s events! 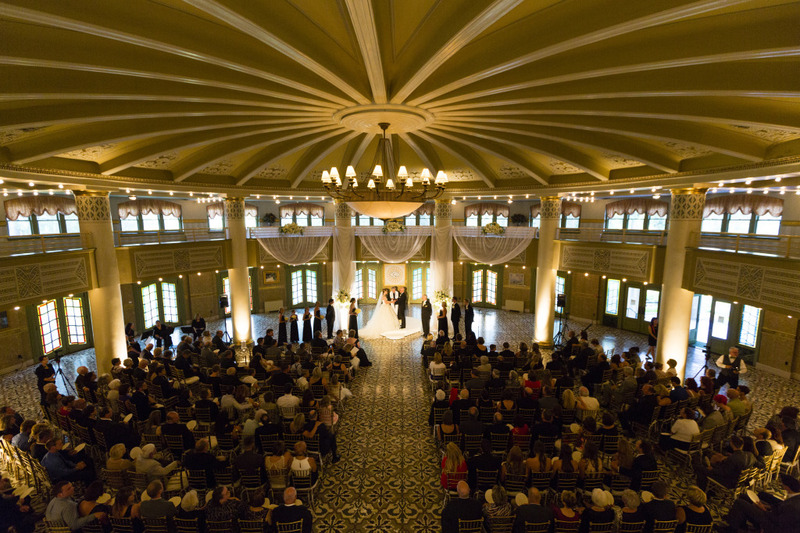 Following the ceremony guests enjoyed dinner and dancing in one of Indy’s most renowned ballrooms – the Indiana Roof. 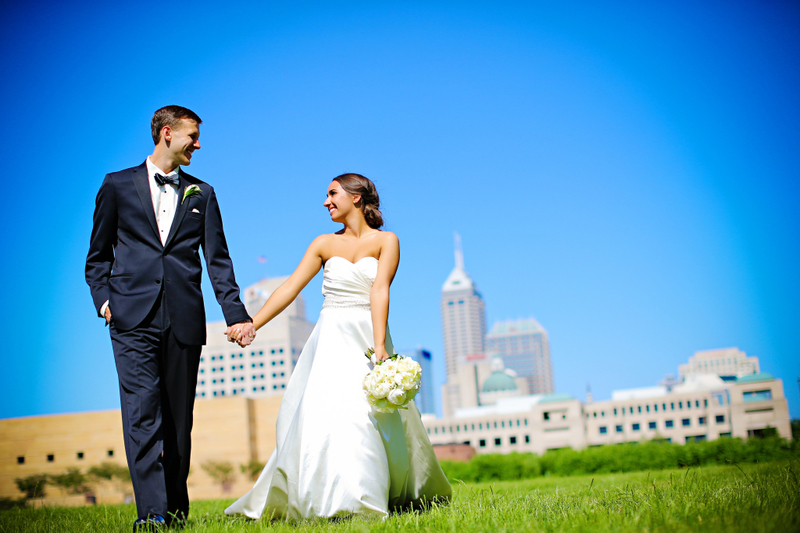 Located in the heart of bustling downtown Indy, on the same night as a major convention, and a home Colts game, Kelsey and David enjoyed the flurry of activity around their reception! 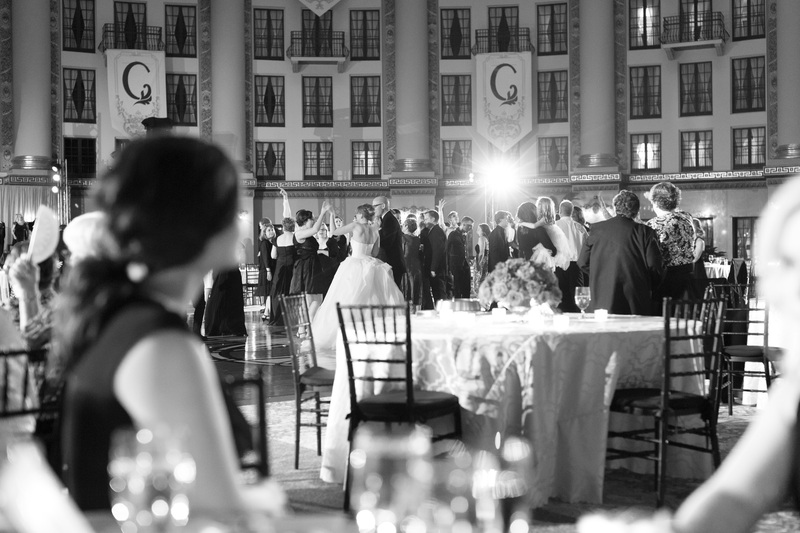 The reception was filled with classic beauty. Crisp white linens, robust florals in shades soft blush to cerise and every tone in between filled the candlelit ballroom. 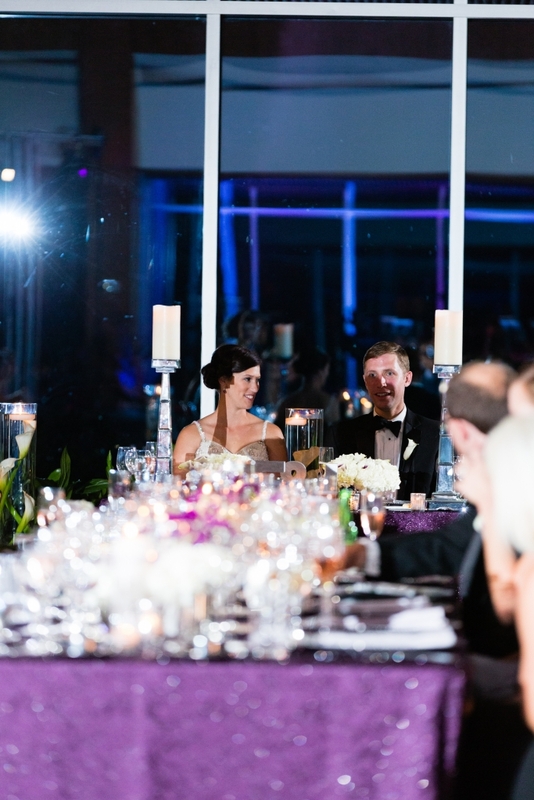 Centered in the space was the table for the new couple, a sweet and intimate dinner for two. Kelsey’s main request was that she have some time alone with David during the day. This romantic space allowed for the perfect retreat for the newlyweds to enjoy dinner, dancing and private conversation all evening. It was adorable to witness their love as they held hands literally the entire night. 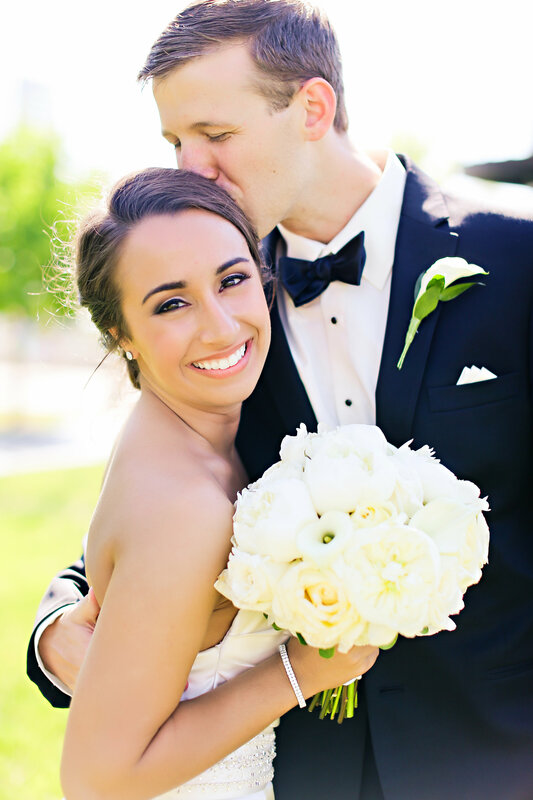 Tiffany Stoner from Nathaniel Edmunds Photography stated that in her tenure she had never seen a groom more in love with this bride. Throughout the planning process, the entire team of professionals could see the couple’s love for one another. 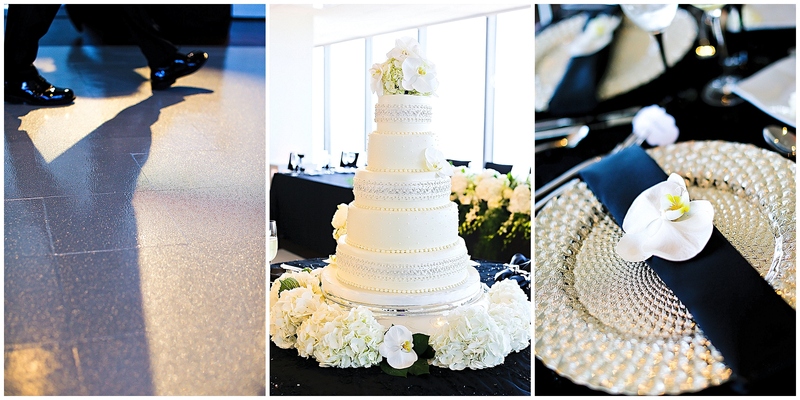 To select their wedding cake, the couple planned a date just for two at Classic Cakes. During the date, they selected a variety of indulgent flavors to surprise their family and friends. 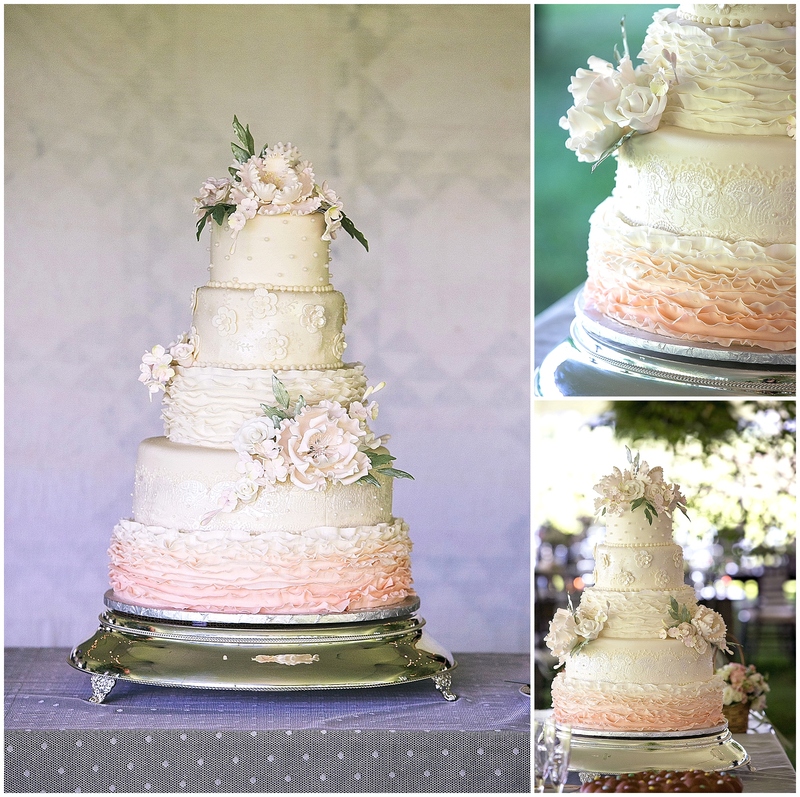 The cake was five layers and had delicate lace applique on the tiers that replicated the lace of her wedding gown. (Truth be told–in my entire career, it was the only cake meeting that I did not attend. – What no cake tasting! 🙂 How could this be!?) A week before the wedding I actually had to call to see if the cake needed fresh flowers because I did not know anything about the details and had to relay that information to the florist. Instead the cake had beautiful gum paste sugar rose flowers which perfectly complimented her bridal bouquet. 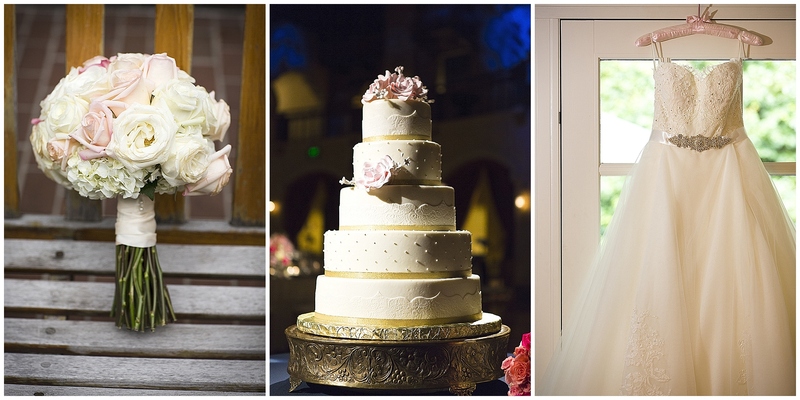 Just like the cake, her dress epitomized classic elegance with a twist of surprise. 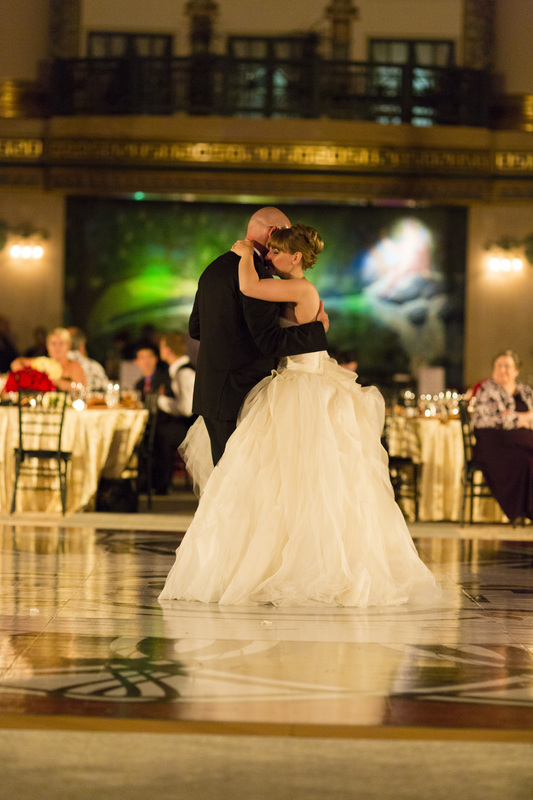 Kelsey floated across the dance floor in her ethereal ball gown to first dance song, “God Gave Me You” by Blake Shelton. The twist of surprise here occurred later in the evening when David’s fraternity brothers and her father paraded the dance floor with the Sweetheart of Sigma Chi serenade. Once the gentlemen were on the dance floor singing, they stayed all night long! 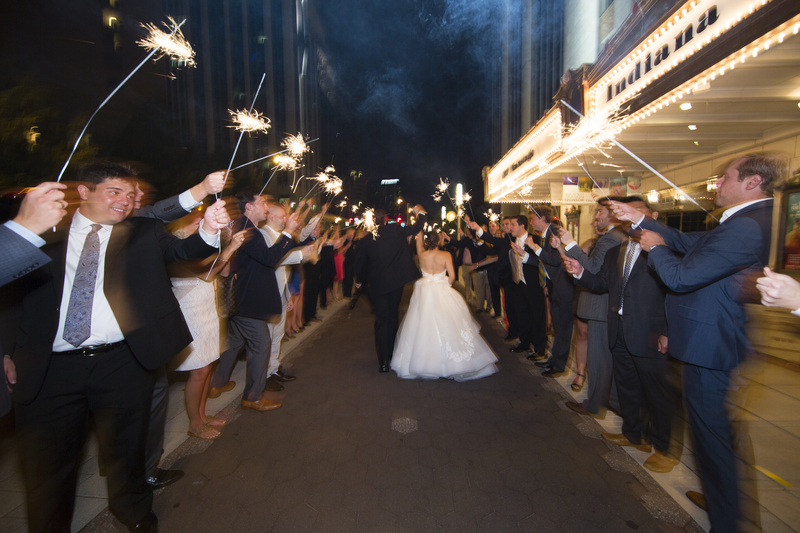 Concluding the evening Kelsey and David exited the ballroom in grand style – to a sparkler exit and awaiting classic Rolls Royce for their getaway! I’ve known this family for over 10 years and had the pleasure of working with them for their 2nd daughter’s wedding. Thank you for for allowing me to help you again, this time with Kelsey’s celebration. It is such an honor! Sara and Curtis have known one another forever! It’s impossible to see a photo of one without the other. They actually went to the same elementary school! 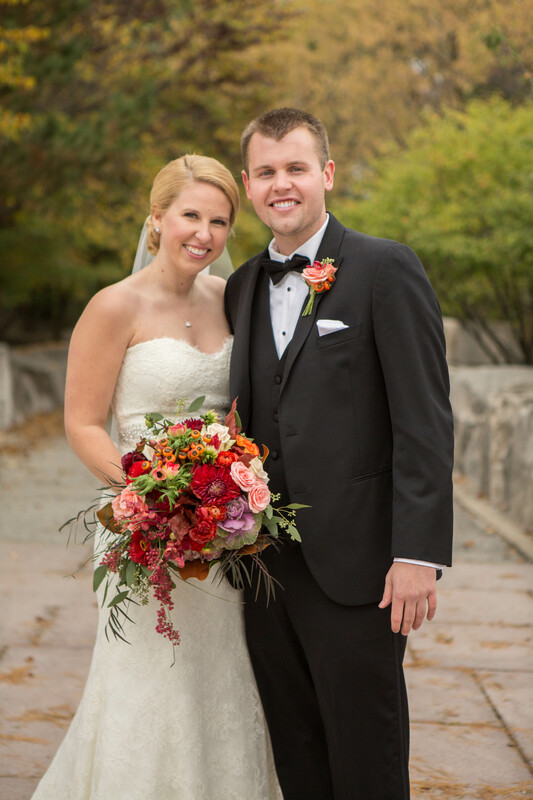 A mere 2 weeks before their wedding, they were finally in the same city as each other having survived a 4 year long-distance relationship because of attending different colleges. As often as possible one would travel to the other school for football games or mini-vacations. One semester they even both traveled to England to study together. 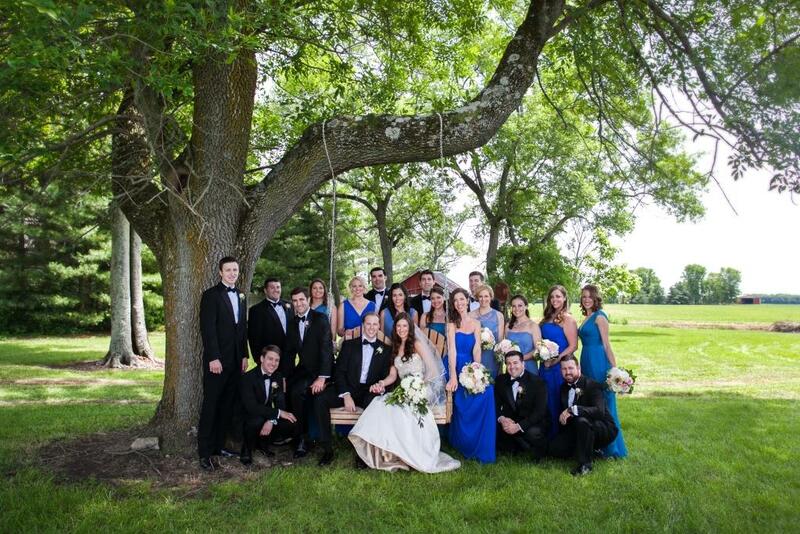 This wedding celebration was a culmination of graduations and the wedding. It was such a joyous time for the couple! Sara is a gem! Her smile is contagious and she radiates happiness! 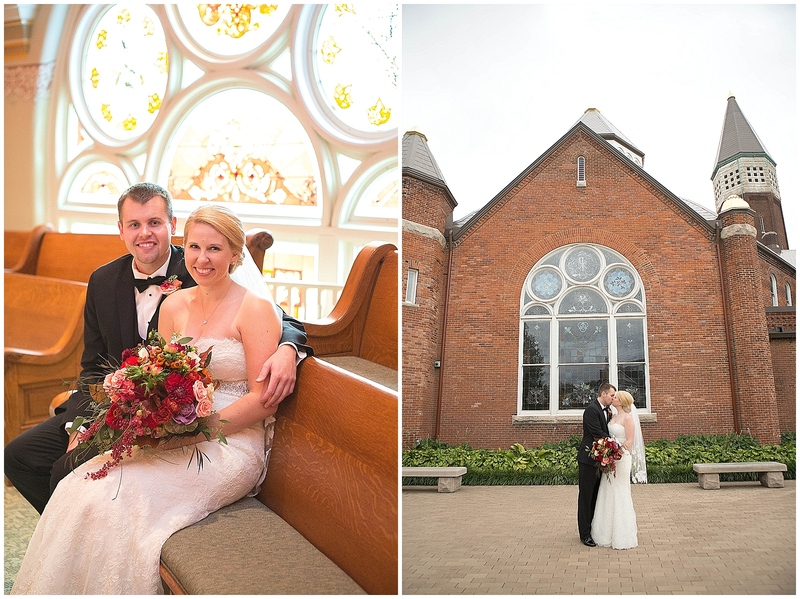 Sara and Curtis were married in their childhood church of St. Barnabas Catholic Church. Both Sara and Curtis had received all of their Sacraments (Baptism, First Communion, Reconciliation and Confirmation) at St. Barnabas. They were the first couple in the church’s history to receive every Sacrament at the church. Having the final Sacrament there as well carried special meaning. Sara and Curtis got married just a few months after Curtis’s sister, Kristen, was married. 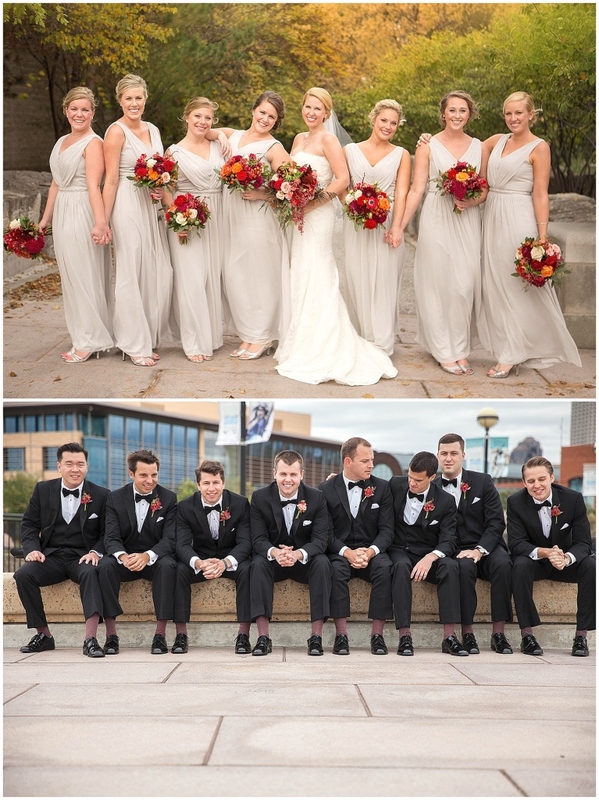 Many of the same professionals helped with his sister’s wedding, and Sara and Curtis wanted their wedding to have an entirely different feel, because, obviously, they’re entirely different people. 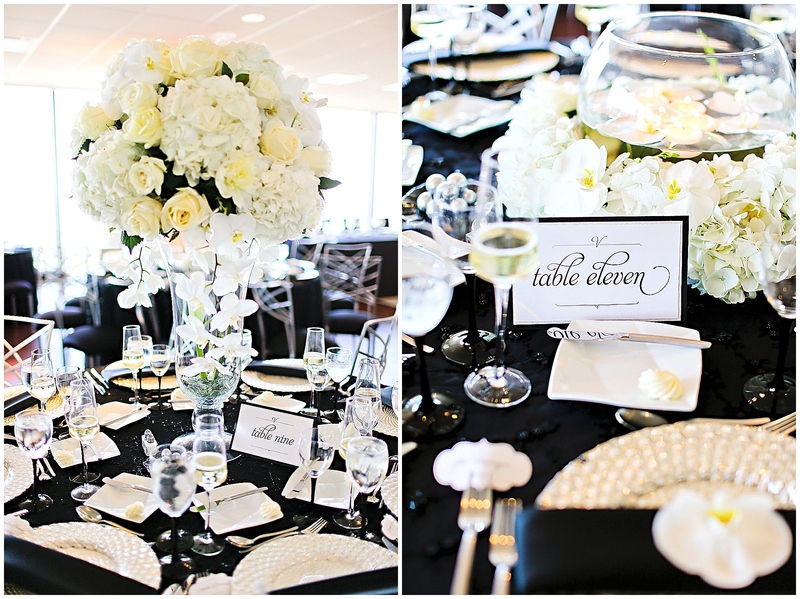 Sara and Curtis wanted a clean, sleek and modern feeling for their spring nuptials. 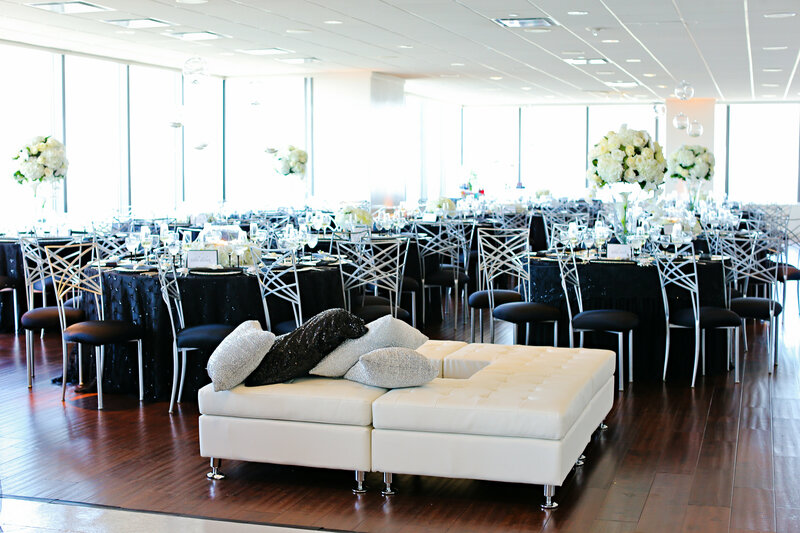 To capture this mood, Sara chose black and white as her color story for the wedding and had a few touches of silver sparkle to capture her fresh modern approach. 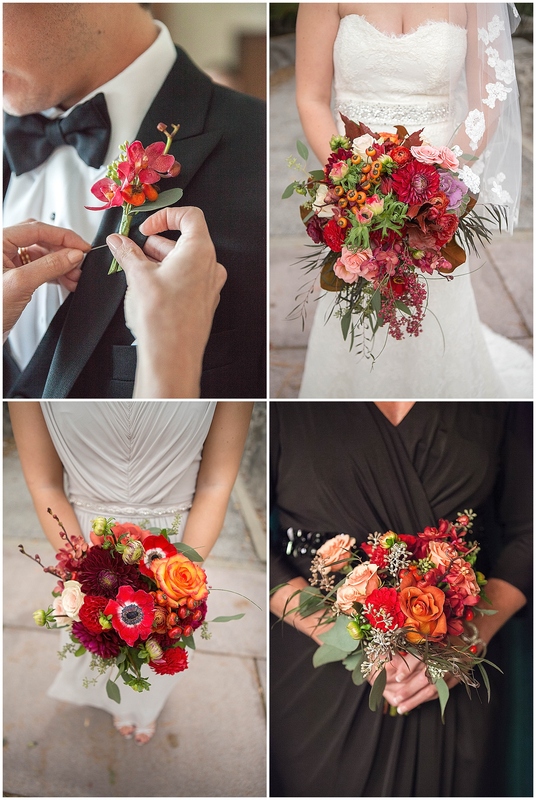 It was fun to help her design an entirely different type of wedding than Kristen and Tim had selected. While the two couples had some similar tastes (like a great taste in wedding planners, photographers and videographers 😉 ) they wanted their events to feel very different from one another. 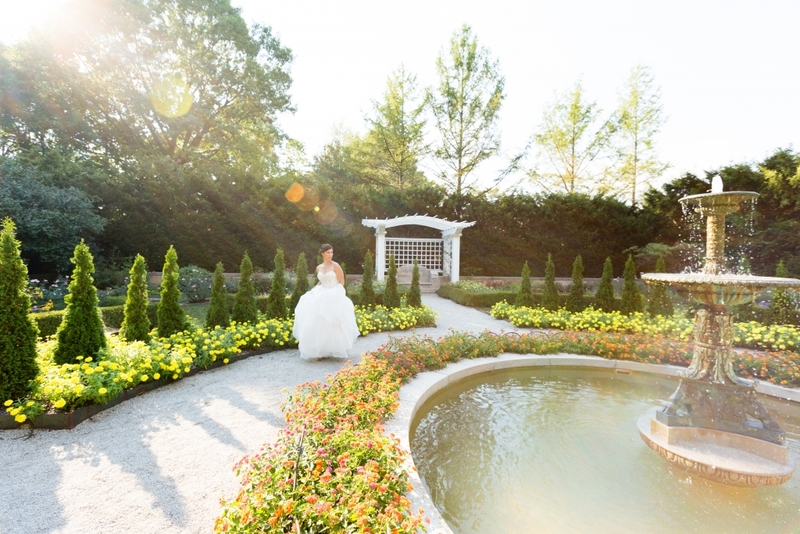 Sara knew the reception location would have to be key in this step. 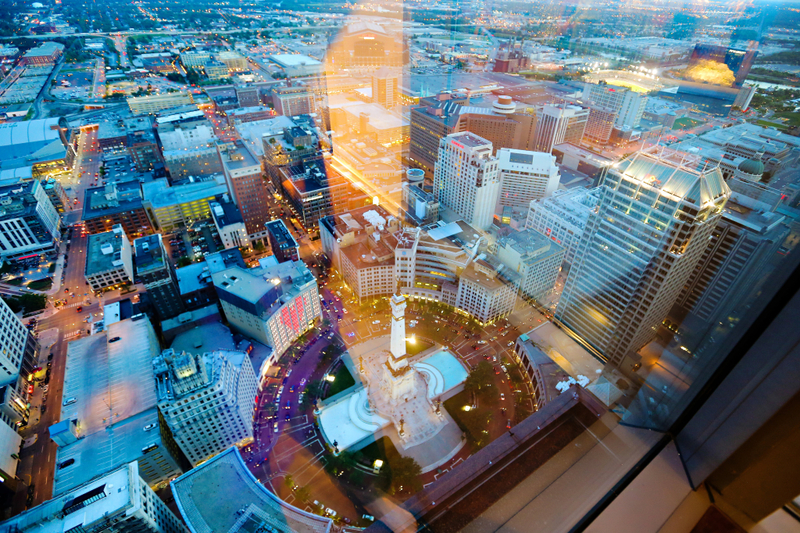 She picked D’Amore high atop the Indianapolis Skyline to set the scene for night’s festivities. Sara allowed us to play! I love that in design! 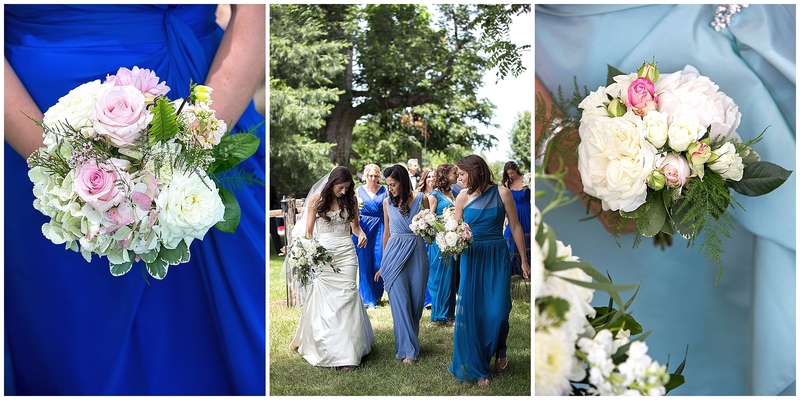 When a bride trusts her professionals, there is truly nothing better. She wanted only pure white flowers. 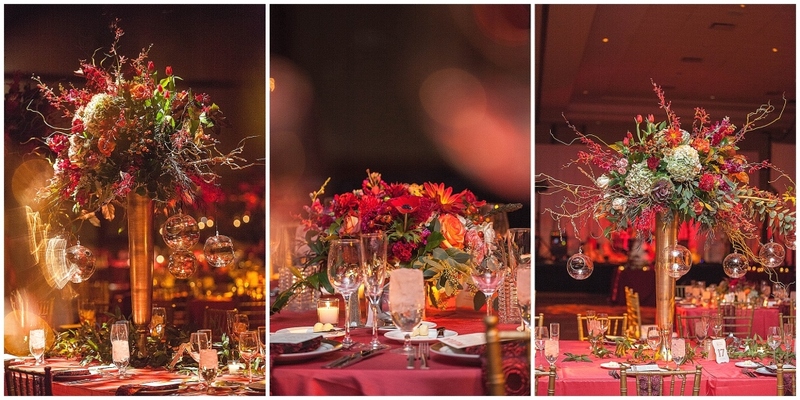 David from the Empty Vase created magic and together we worked to pair his florals with sensational linens which made the room a delight for all of the senses. The flowers were spectacular. 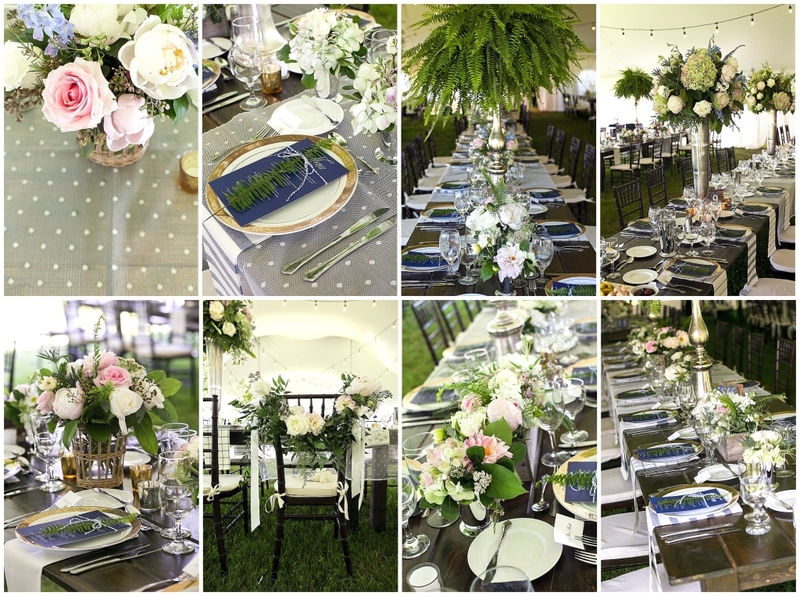 Crisp snowy phalaenopsis orchids, dreamy peonies, fragrant roses and hydrangea created stunning tablescapes. 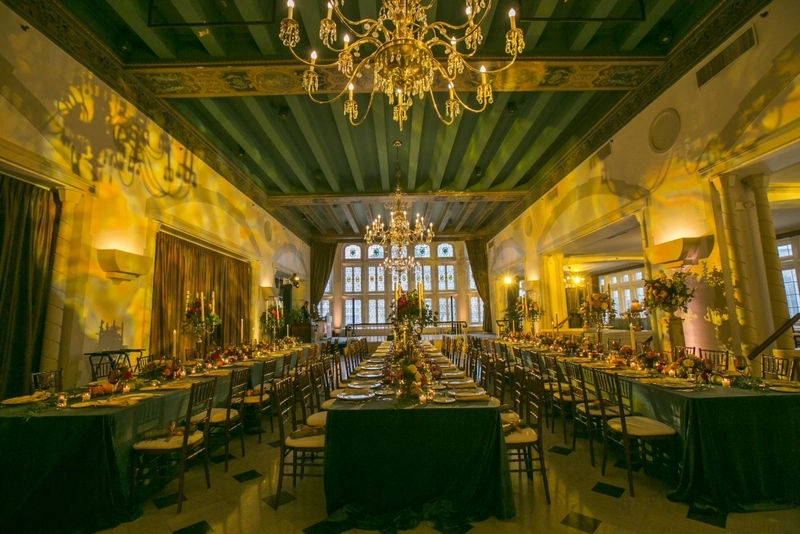 Chandeliers were created with votive candles and orchids to add more sparkle to the space which glistened because of the silver charger plates and beaded linens. The linens begged to be touched because of the intricate beading and tulle skirts. Special accents included the beautiful cake which had the intricate detail from Sara’s wedding gown on its 5 layers and glittered chocolate truffles (which were a surprise for Sara) to match her show-stopping glittered dance floor! One of my favorite parts of the evening was actually seeing guests reaction to the cocktail and vip lounge space. This area reminded me of a cool Miami club. 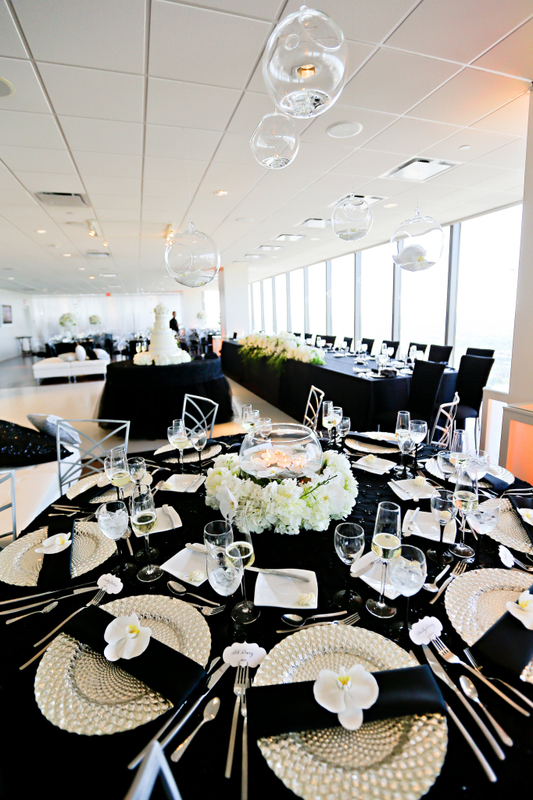 It was filled with fun chandeliers, white furniture, sparkling sequined pillows and linens. The focal point of the room were over-sized monograms on bookshelves of the couple’s adventures. 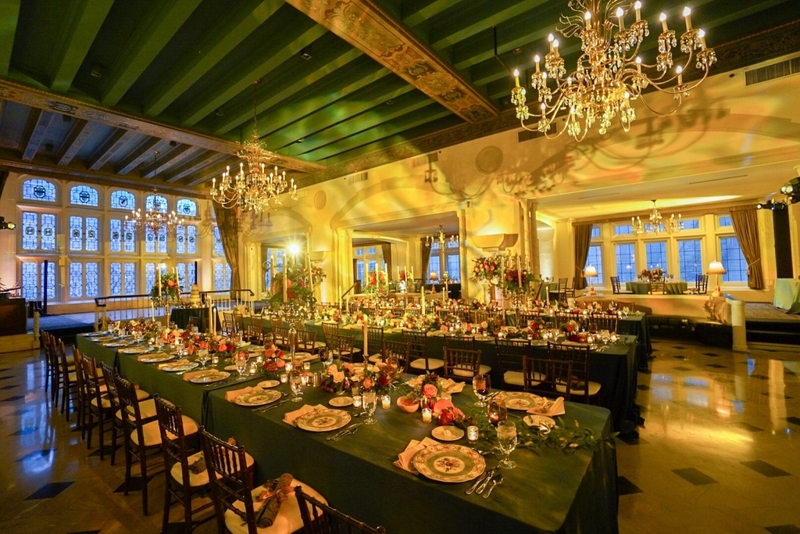 Their toasts looked majestic with the sky behind them and a cascade of chandeliers created with votive candles along the windows. 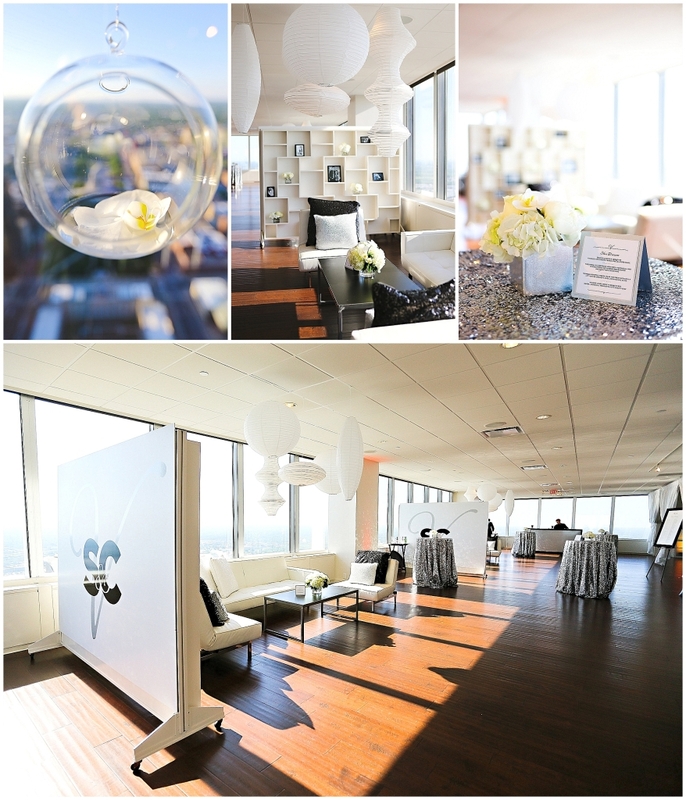 As night fell over the celebration, guests loved watching the sunset over the Circle City. As the lights began to flicker on over the skyline, Curtis pulled Sara to the south side of the space to reveal this spectacular surprise — the IPL building illuminating an over-sized heart in her honor! Curtis’s childhood dreams came true though when his “lifelong” wish was fulfilled. 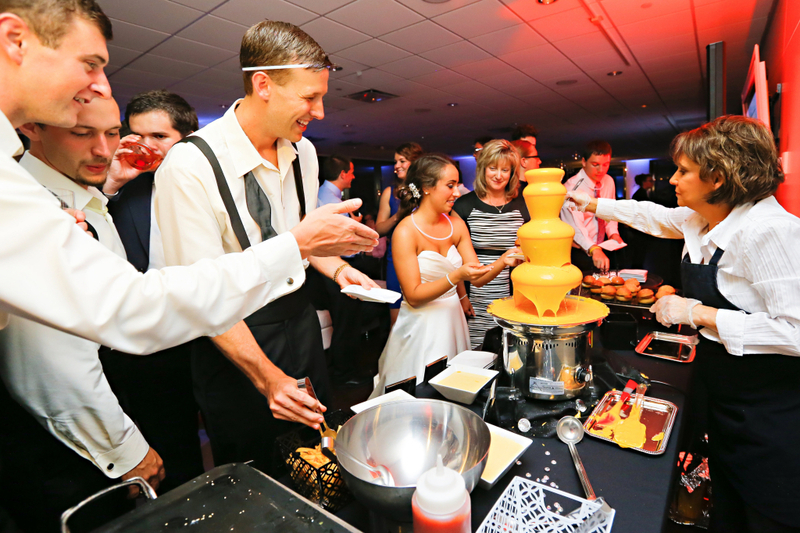 His childhood soccer team had long joked they wanted a “cheese fountain” at his wedding. Well… they got it! The inner 10 year old boy in each one of them came out when it was revealed during dancing complete with corn dogs, burgers, fries and other late night munchies! This couple is amazing! 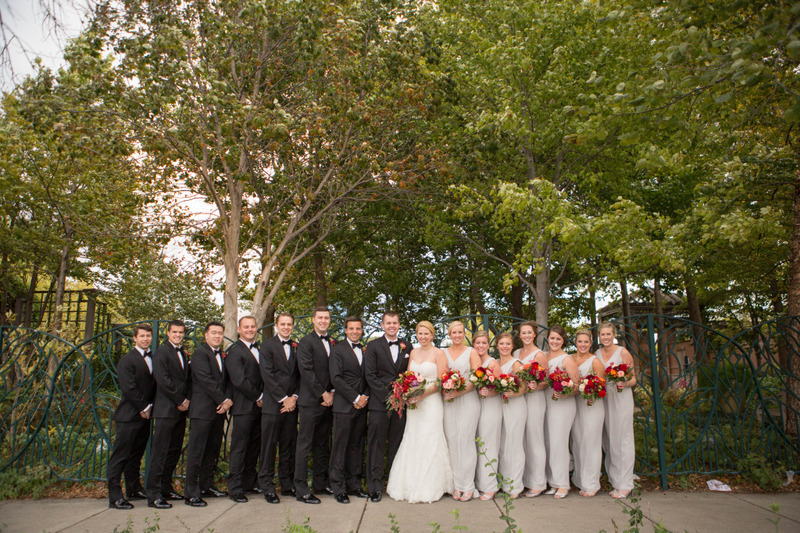 They are sweet, kind, generous and never – I mean NEVER stopped smiling the entire wedding. (The entire wedding planning process would actually be more accurate.) I have really relished in my time with both of their families and loved helping them create this special celebration. I’m so thrilled they’re finally in the same city (and now in MY city!) so I can keep in touch with these wonderful people and their parents. Thank you for allowing me to be part of your lives during such a special time. It was truly an honor. 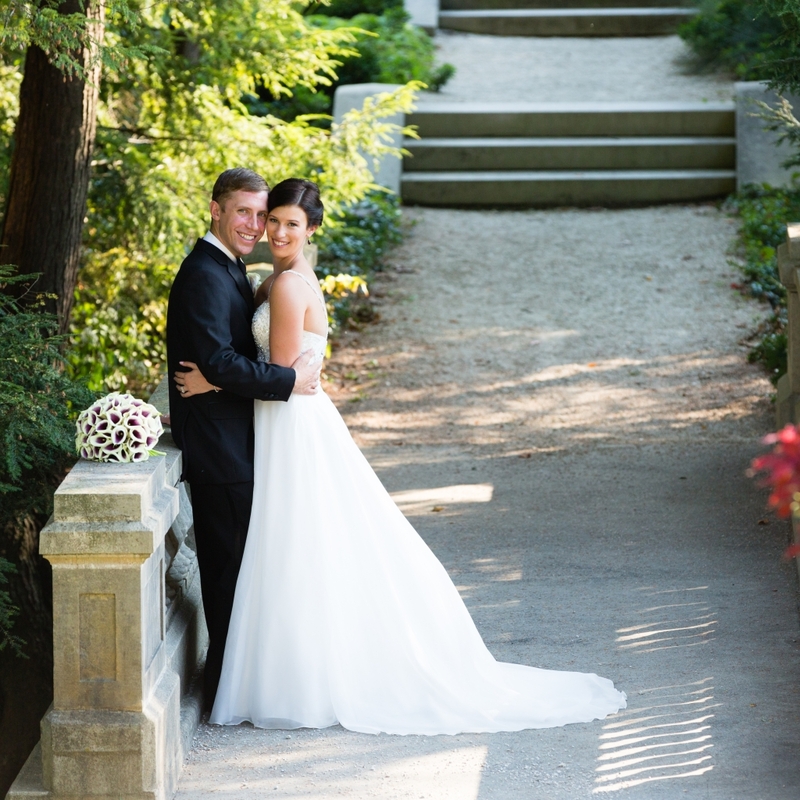 Congratulations Sara and Curtis! May you always have blessings you deserve and all the nacho cheese a guy could ever want! “Beauty is as beauty does.” Her entire family is beautiful – inside and out. 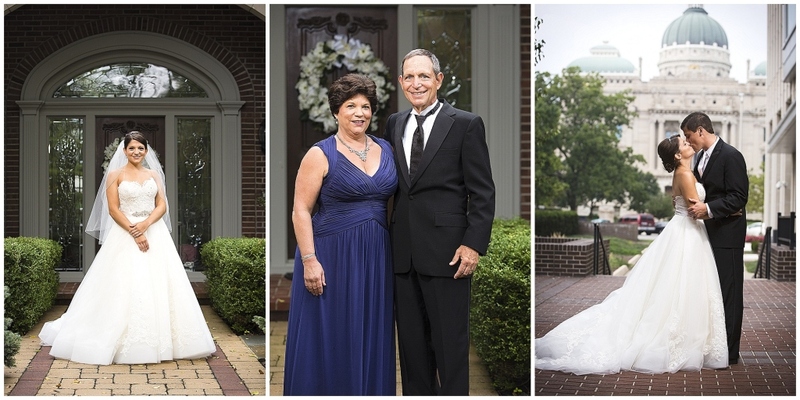 Her new son-in-law is as well — and frankly, so are his amazing parents. They hosted the wedding of Brian and Shelby without a second of hesitation at their home and are among the most hospitable people I have ever met! Their hideaway in Nashville, Indiana is called Serenity Lake Lodge. Serenity says it all. 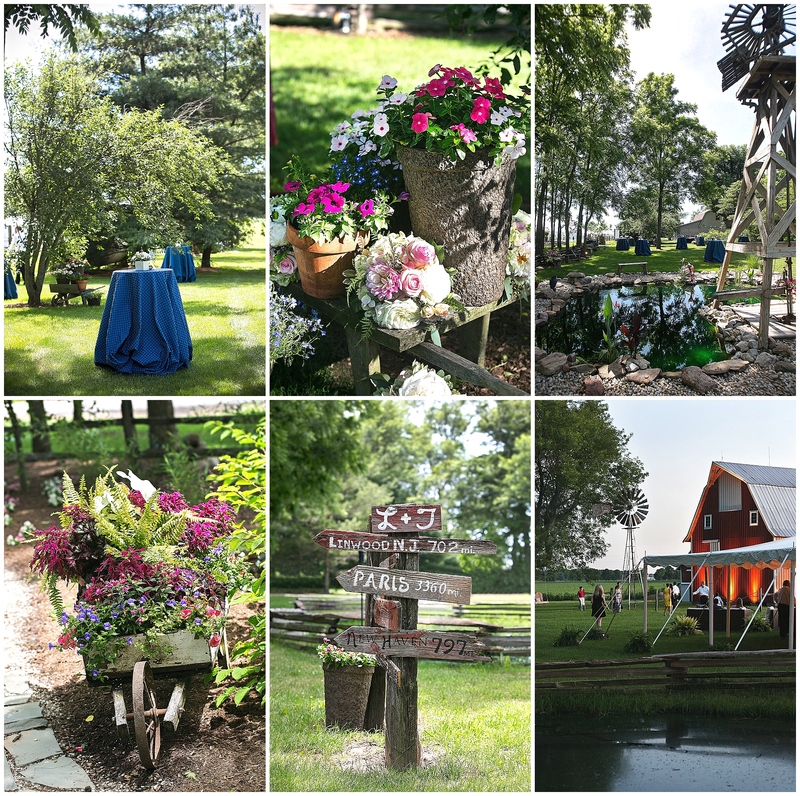 The rolling hills of Brown County welcomed the guests for Shelby and Brian’s spring wedding with their lush green trees. 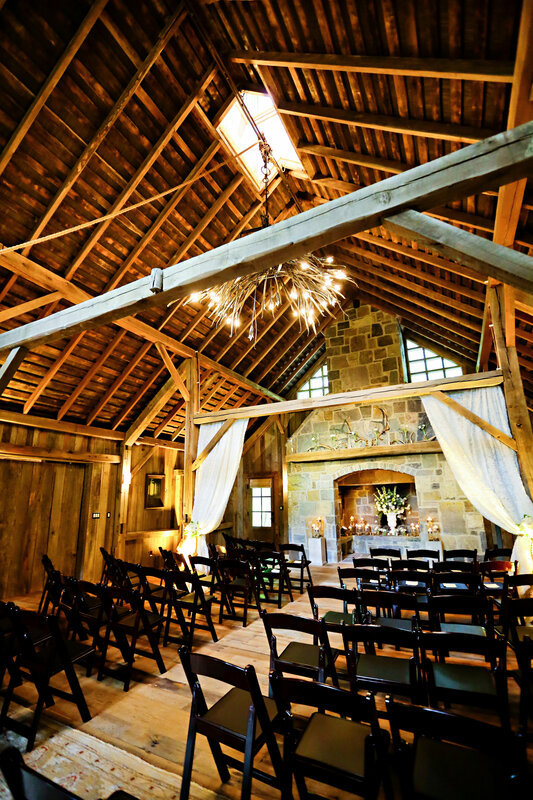 At the top of the hill stood the stately “barn” lovingly designed by Brian’s father, Gary to host their guests. 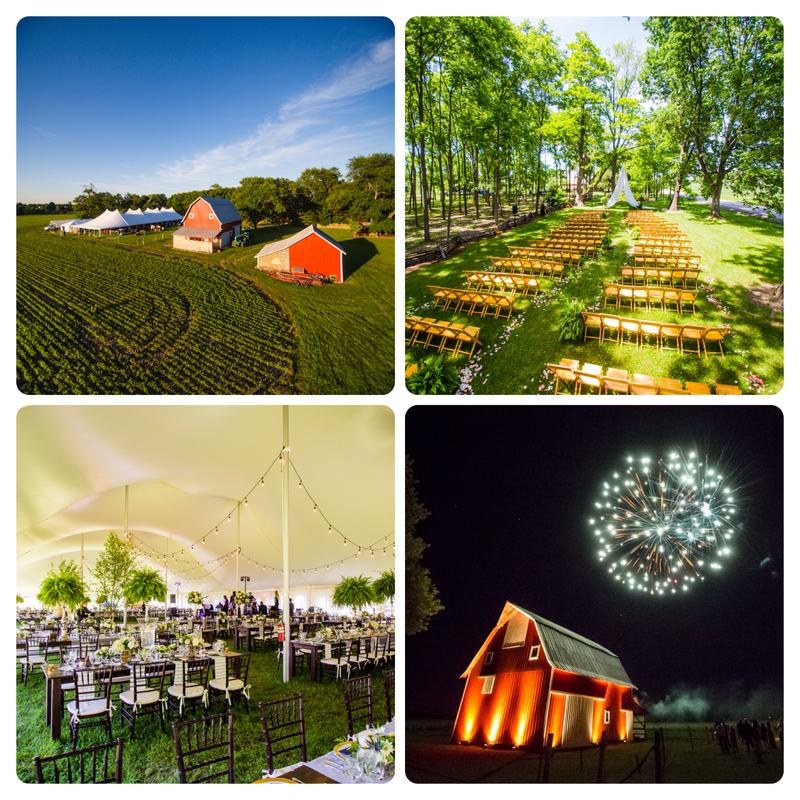 Brian and Shelby wanted a warm, rustic and intimate celebration filled with family and laughter and they achieved it all! 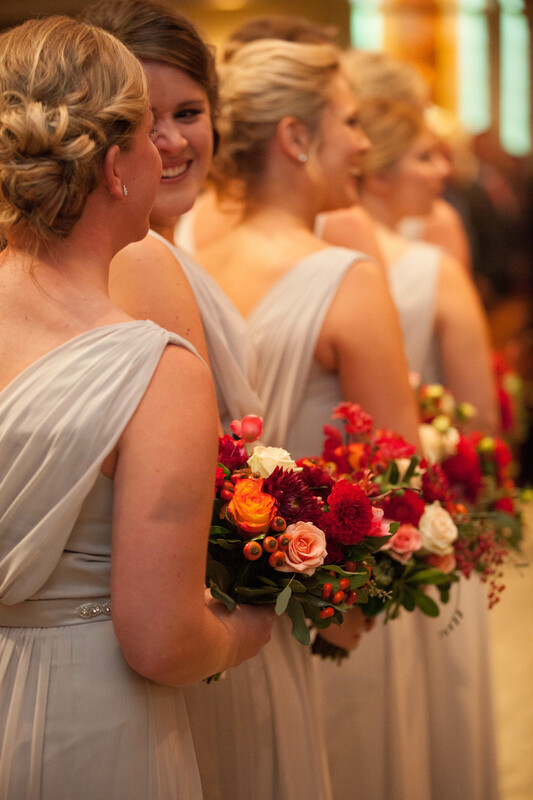 Shelby looked stunning and wore a really beautiful hairpiece that her sisters had each worn. I hope her darling niece will continue the tradition another generation. Brian in his Navy suit and his ever present glass of Scotch looked stately and regal. 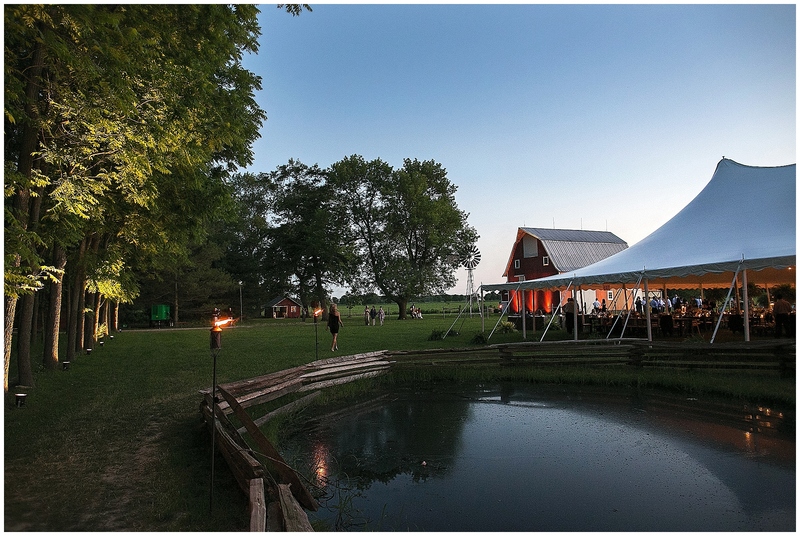 The families greeted their guests before the ceremony on the patio of the barn and the bocce court which for the evening was filled with chairs and seating covered in lighting to allow guests an amazing view of the countryside. Brian’s mom beloved “Marie Antoinette” – a 200 year old French statue brought over from Europe was even dolled up for the occasion. 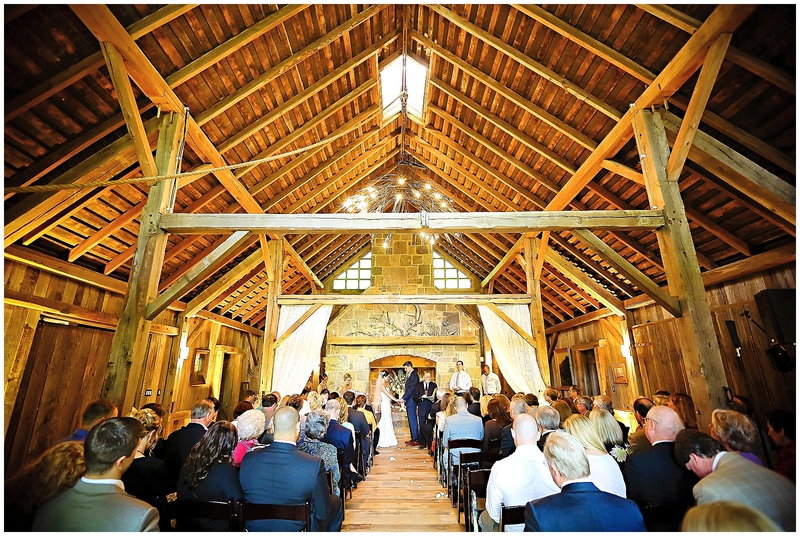 Guests were able to get their first glimpse of the barn for the ceremony were in awe of the size and grandeur of the handsome lodge. 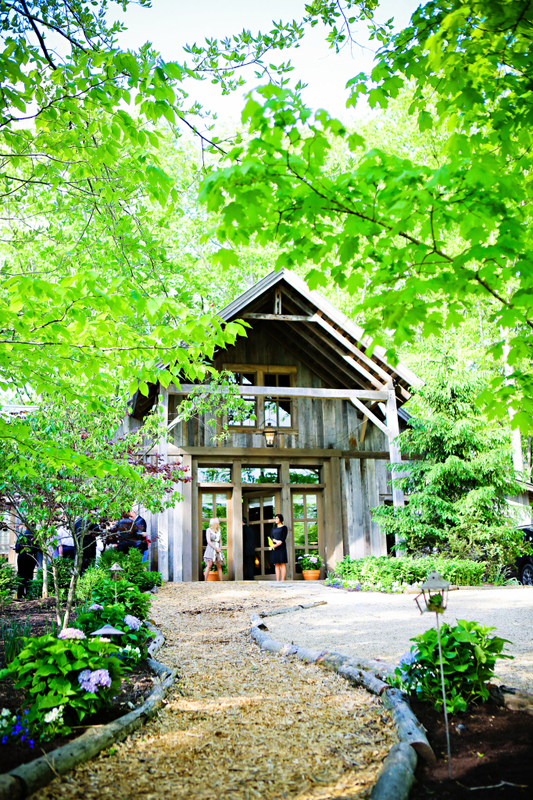 Strong and rustic, yet refined and romantic, the lodge was a perfect host for the nuptials. Brian’s proposal was at the courthouse in Brown County because he wanted a location that could “stand the test of time.” Admittedly, I think the location for their ceremony does exactly the same! 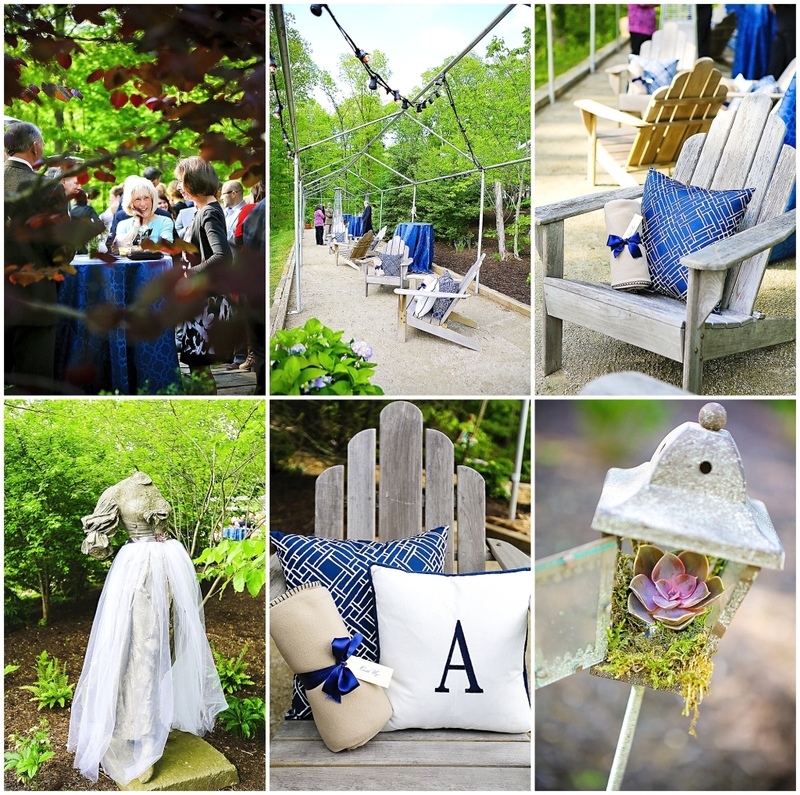 Following the ceremony guests enjoyed a family style meal on long farm tables with eclectic stoneware and cozy lap blankets to warm up the spring evening. 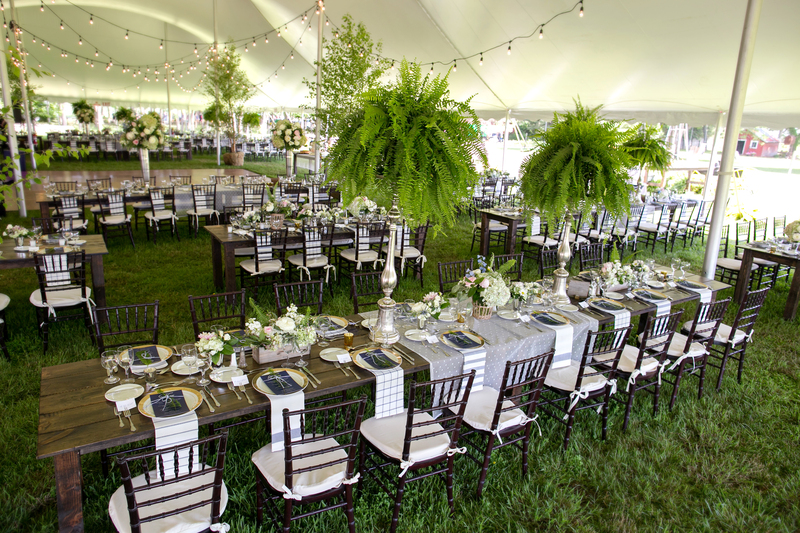 The long tablescapes were nestled with burlap table runners filled with moss which overflowed with floral. 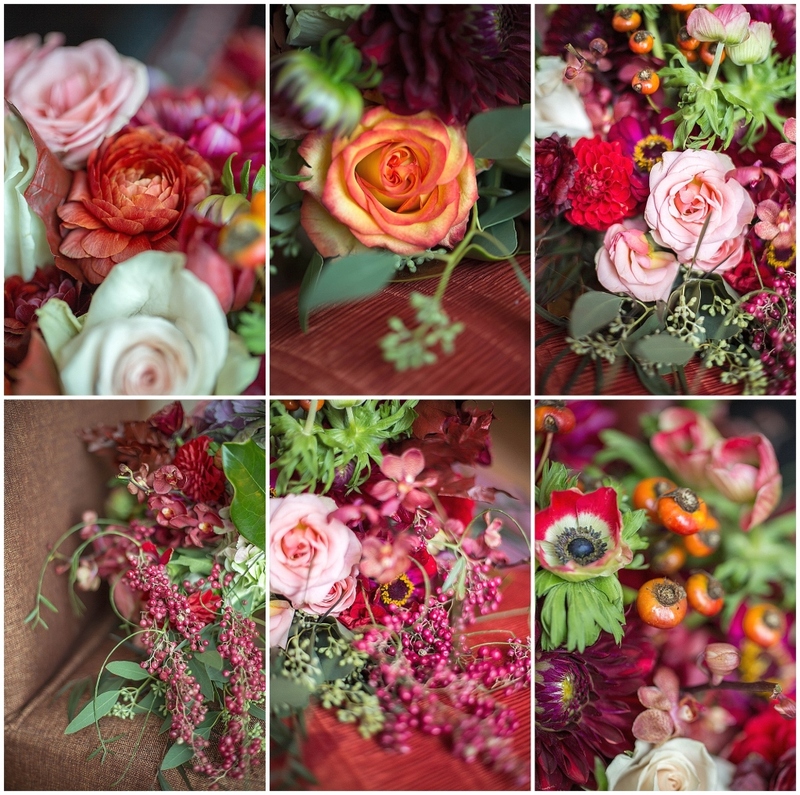 Each guest had intimate take home bouquets of flowers including peony, ranunculus, thistle, roses and hydrangea. 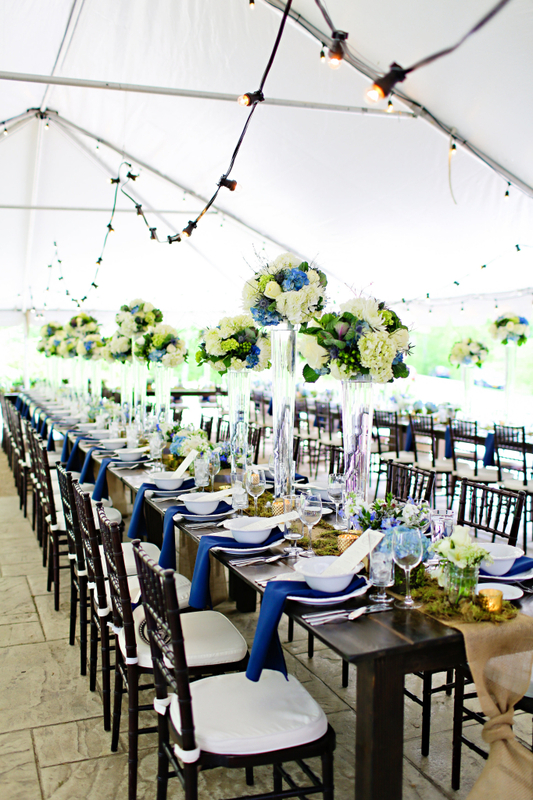 These darling florals were tucked under tall floral which gave height to the crisp white tent. 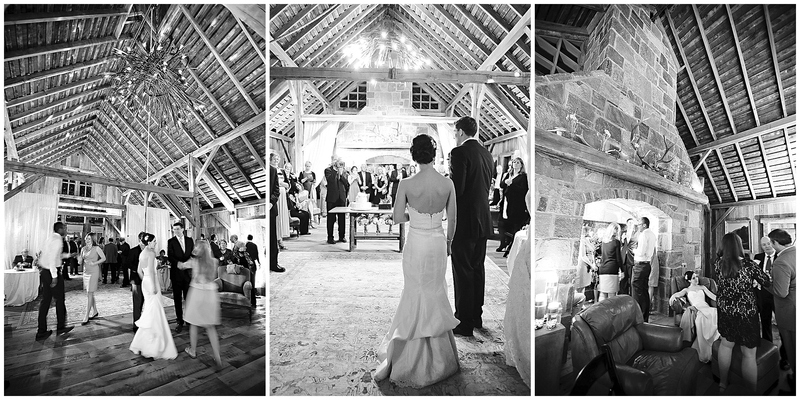 As guests finished dinner, they entered the barn once again for the remainder of the celebration. Here the evening finished with (TWO) surprise wedding cakes for Shelby, toasts and dancing! 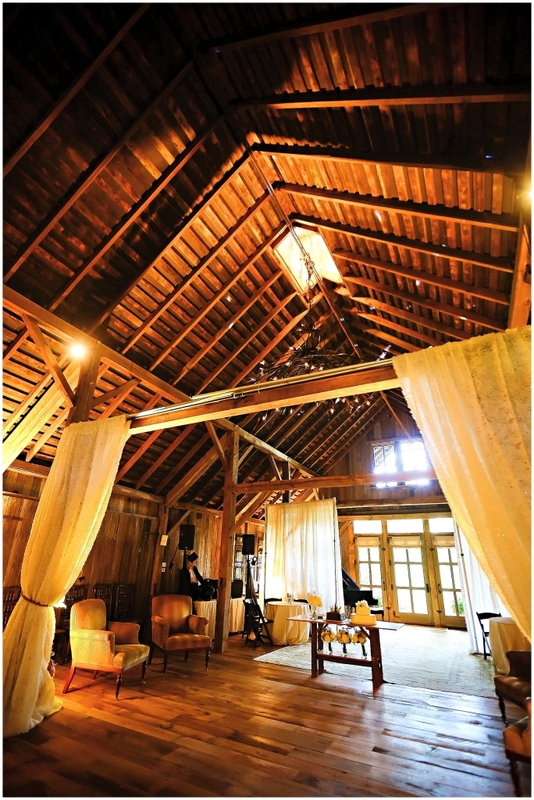 The barn had been transformed to its traditional state. The barn is normally a lovely lodge filled with furniture, art, two (I sense a theme here) grand pianos and is a lush space for family and friends to gather. I loved watching evening fall over the barn. 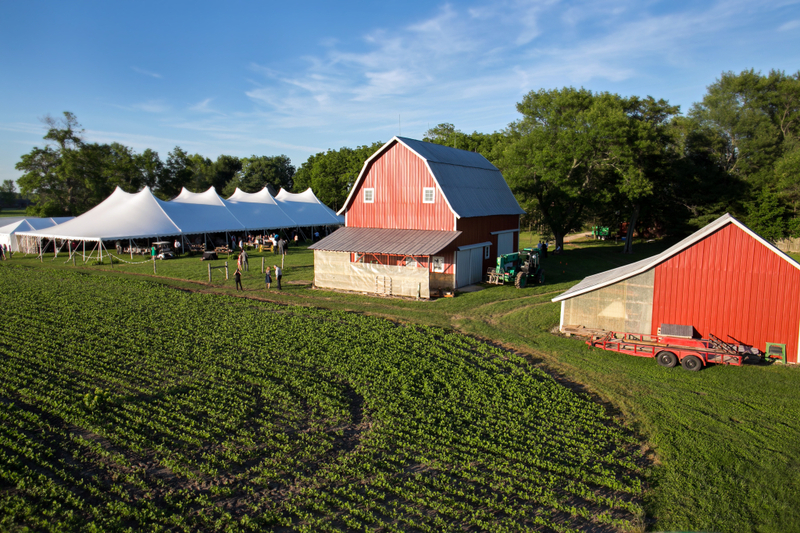 As the sun set, the barn seemed to radiate a warm glow – one that matched the mood. The evening was filled with a spirit of gracious hospitality and bounty. Everywhere late night snacks were available, wine was offered, and even breakfast breads were lovingly prepared for the next morning and placed in cars by the valet staff. Guests had little doubt this was a family affair and you were a guests at someone’s home. 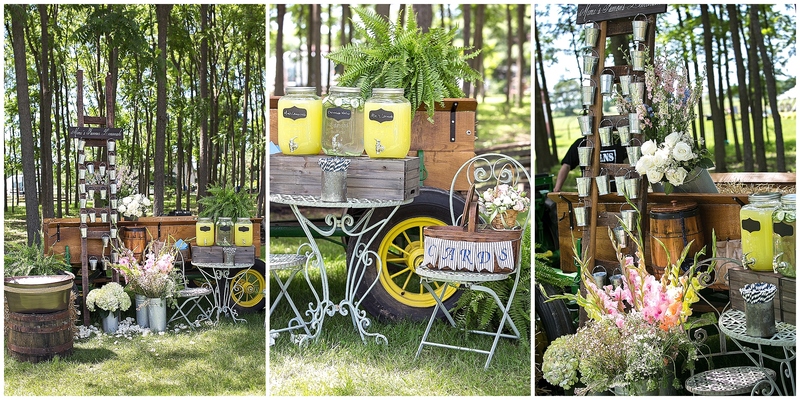 It truly was an honor to help these two families create this celebration for their guests. They are warm, caring and kind people who wanted to welcome their friends to this wonderful evening. I’m thrilled I can now also call them all friends!